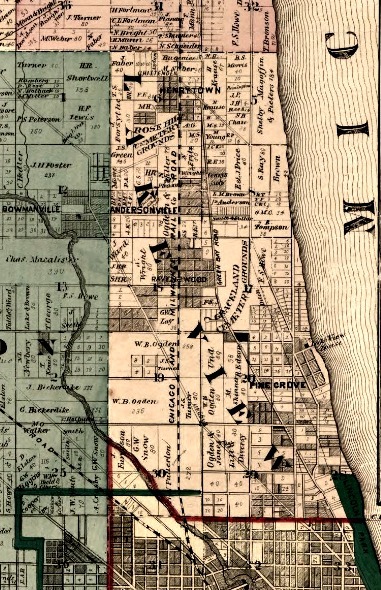 & Devon, Fullerton on the right side. 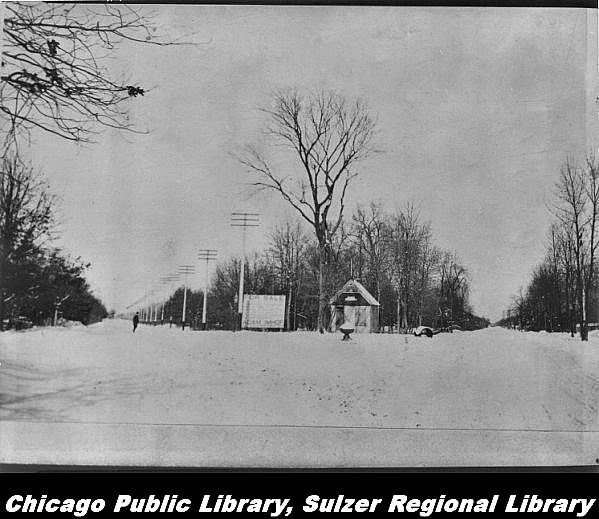 photo - Edgewater Buzz - thanks Bob! 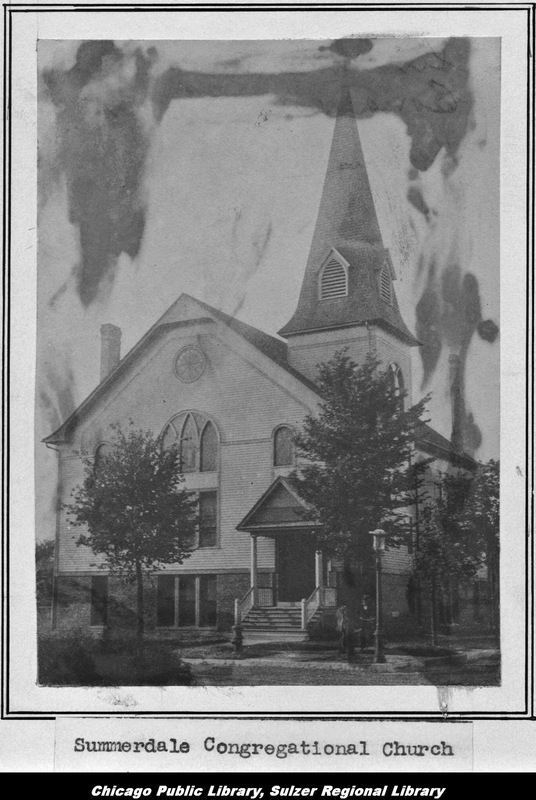 One of the first schools of the township and apparent meeting site of the formation meetings prior to 1857. 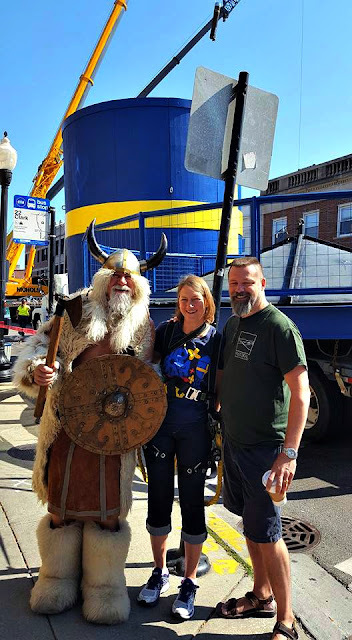 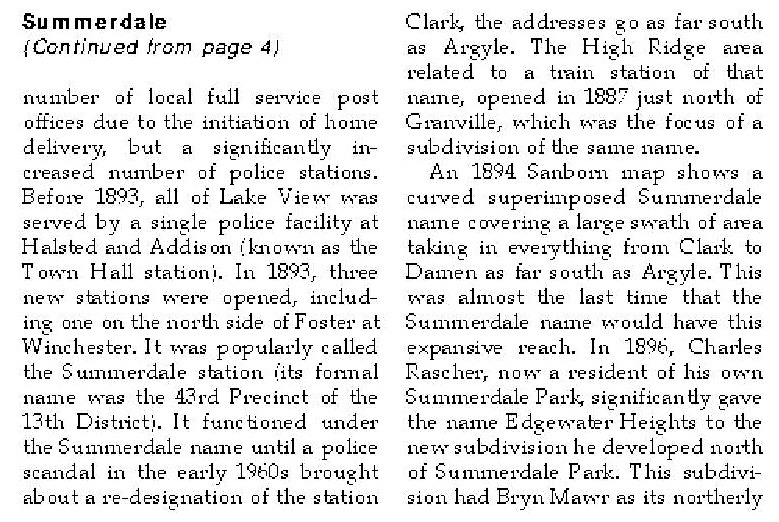 According to one urban legend the Andersonville may have been named after a Norwegian minister named John Anderson. 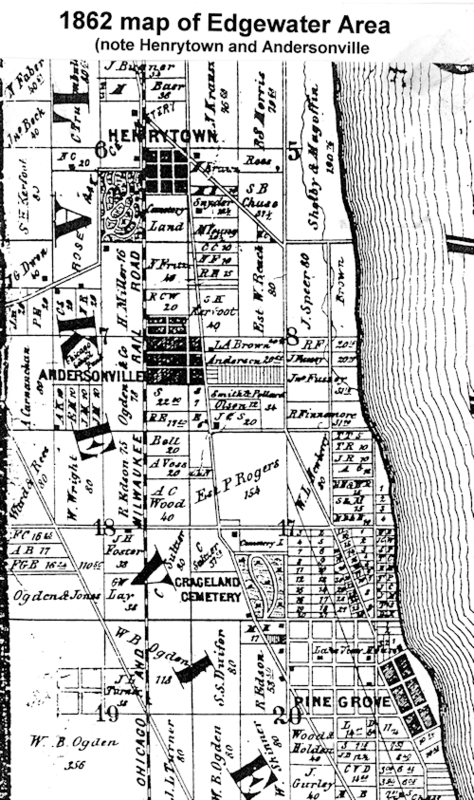 Mr. Anderson purchase property just south of Foster Avenue and east of Ashland Avenue in the late 1840’s. 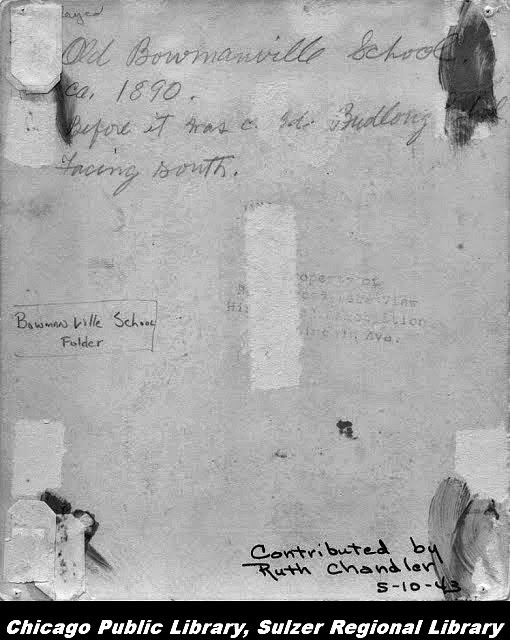 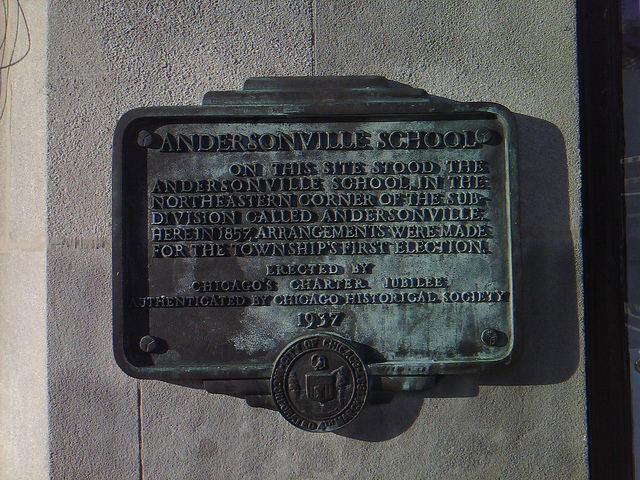 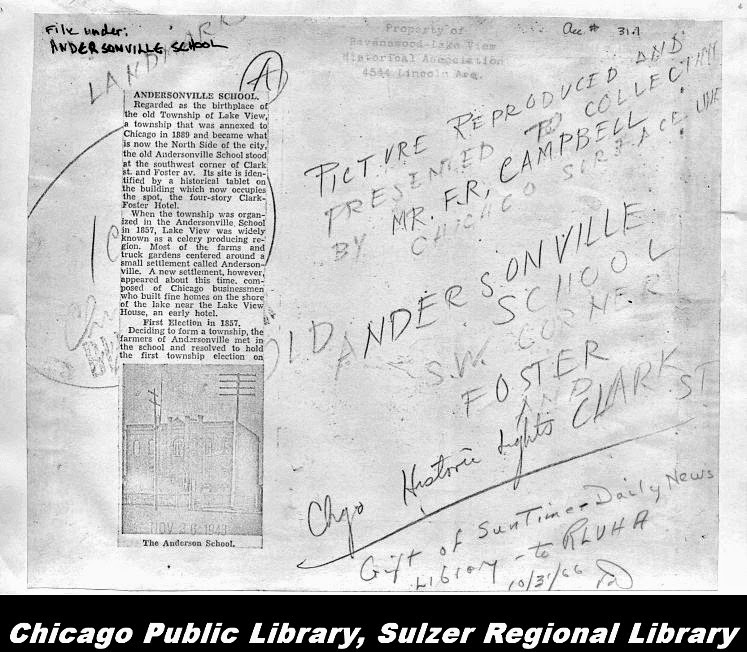 Apparently, one of the first schools in the township, Conrad Sulzer School (Ravenswood Elementary) the other, was named after Mr. Anderson and simply called Andersonville School. 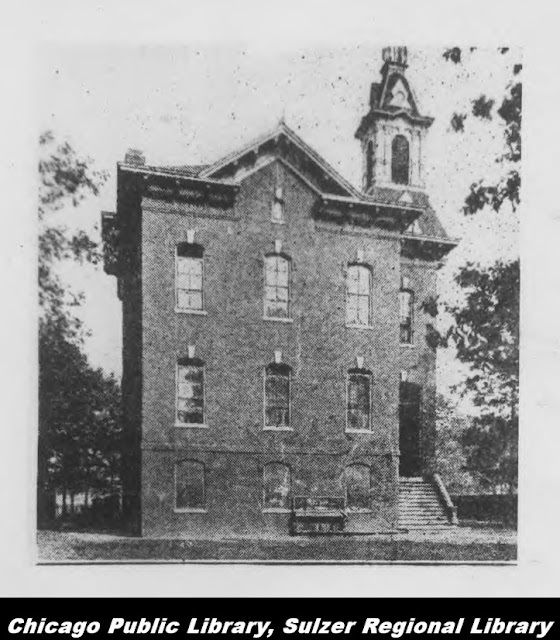 This school once located on the southwest corner of Foster and Clark Street (1855-1925) served as a meeting place for township civic leaders (p.263) like I.S. 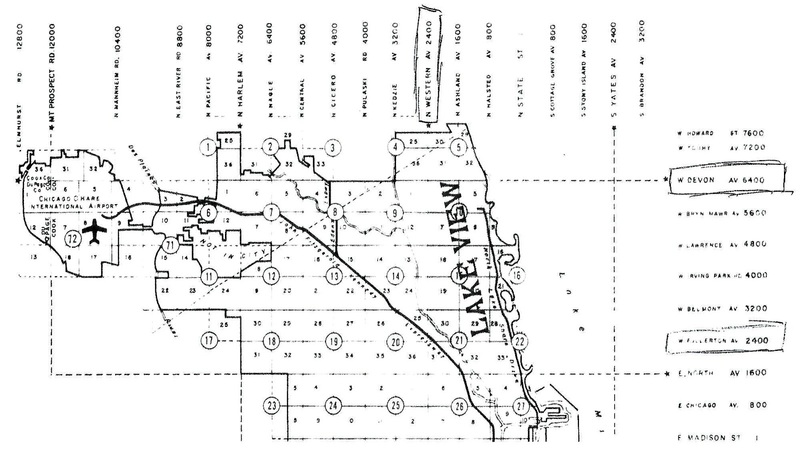 Skippy, John Mauritzen, and Dr. Conrad Sulzer to organize Lake View Township. 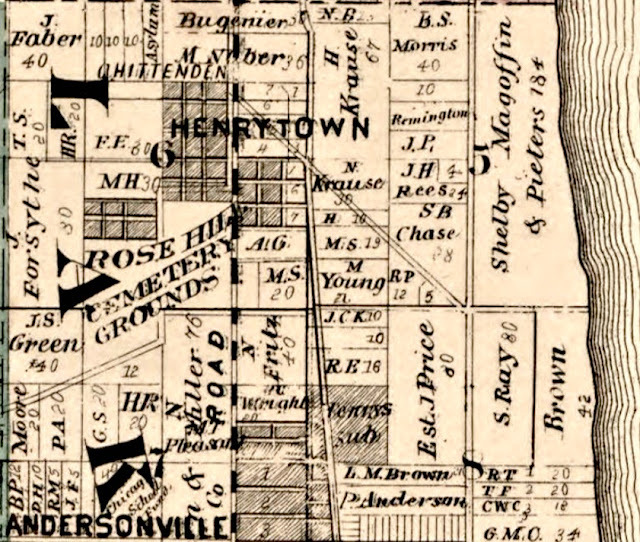 While Mr. Anderson’s fame maybe in doubt there is no doubt of the contribution of Pehr Peterson who established an estimated 500 acre nursery that probably serviced the new cemetery of RoseHill by 1859 among other institutions in the township and the City of Chicago.Dr. 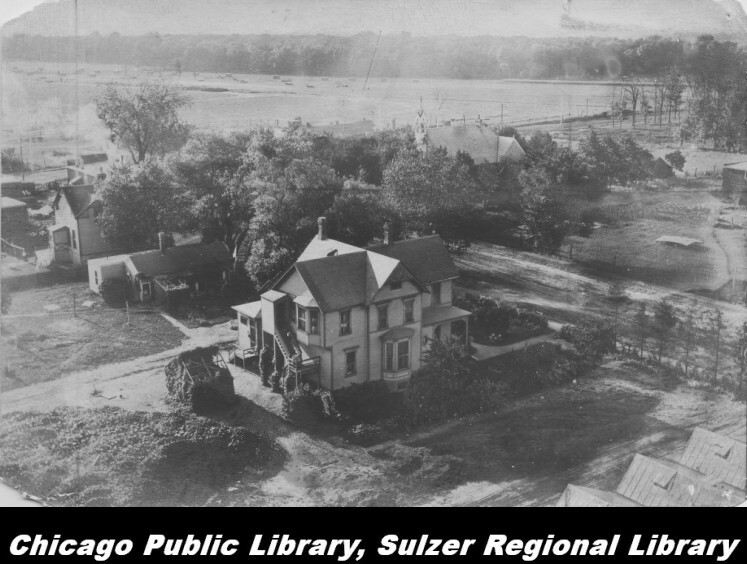 Conrad Sulzer regarded as the grand-daddy of the establishment of the township also owned a nursery but serviced the new Graceland Cemetery as of 1861. 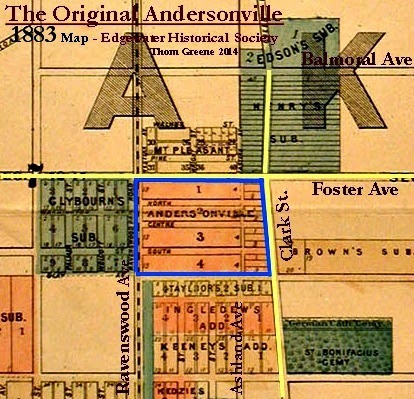 The subdivision of Andersonville began to flourish after the Great Chicago Fire of 1871. 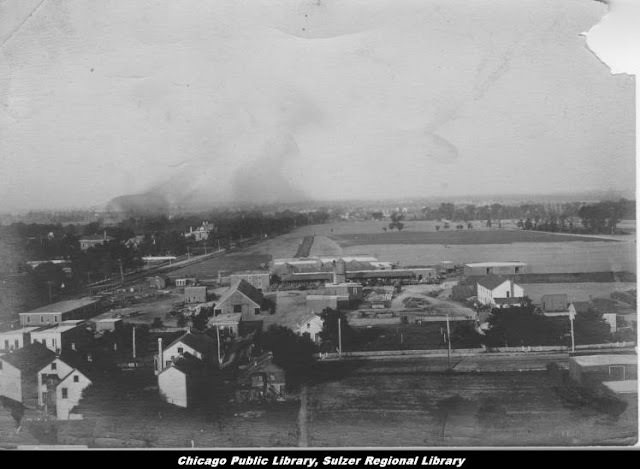 After the fire the city building codes changed and wooden sidewalks and buildings needed to be more fire resistant and more costly to build. 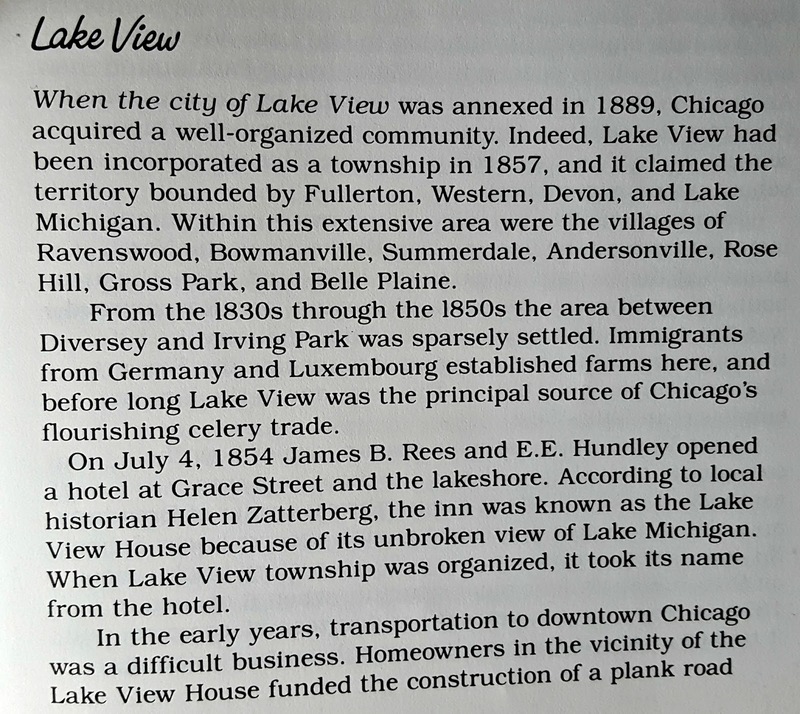 Not so in Lake View Township until after the annexation of the township in 1889 by the City of Chicago. 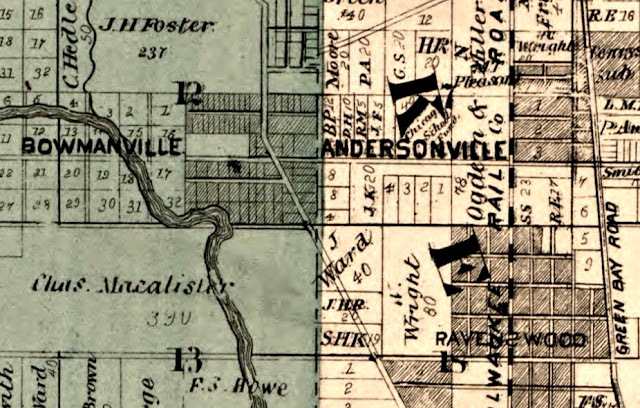 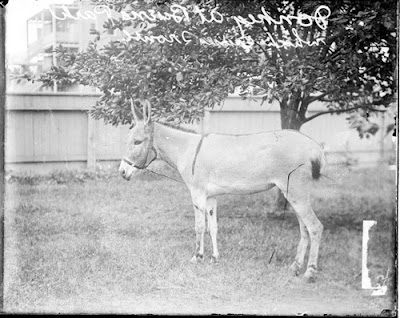 Still, Andersonville subdivision remained a ‘backwater’ community until 1910. 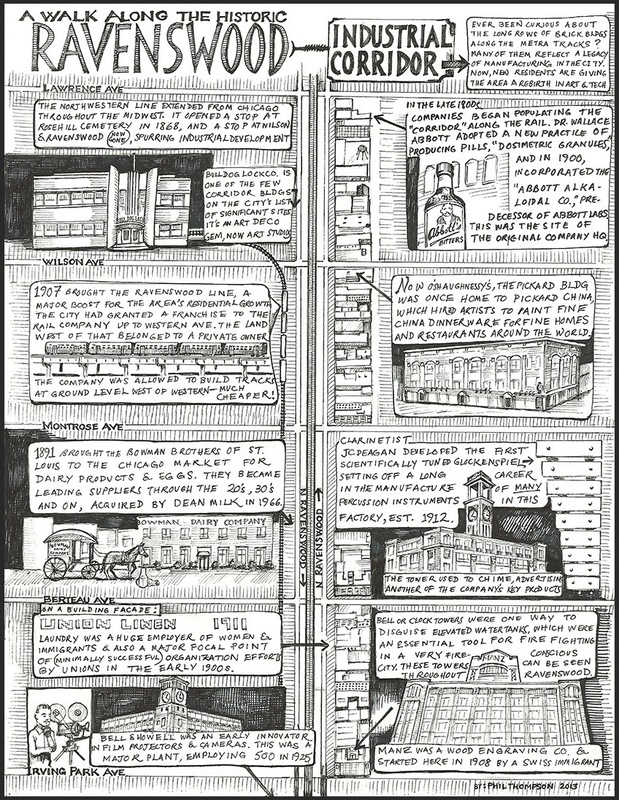 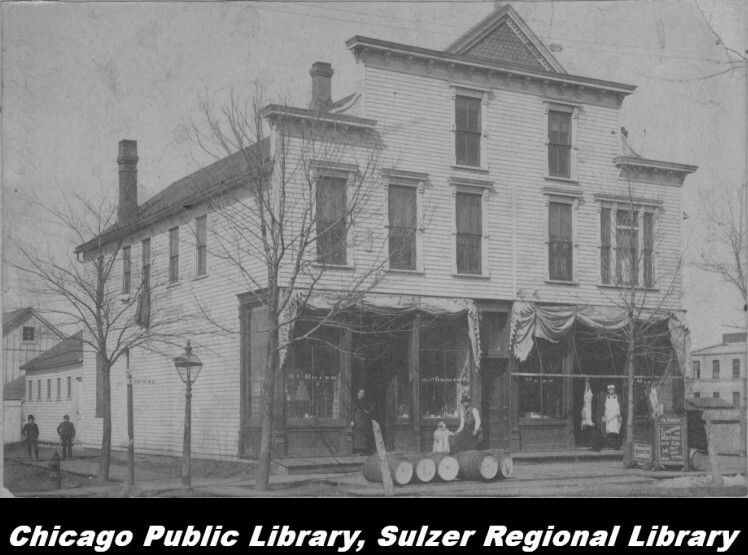 To learn more about history of this community visit the Edgewater History Society as well as the neighborhood website. 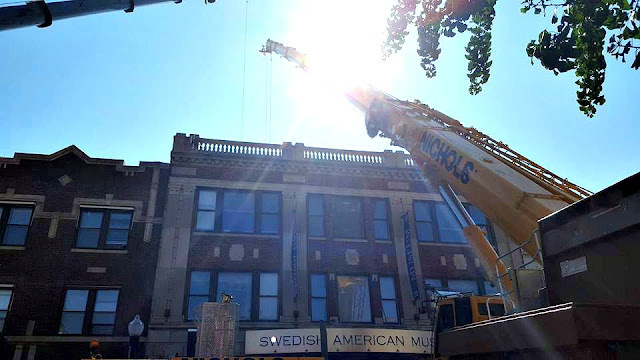 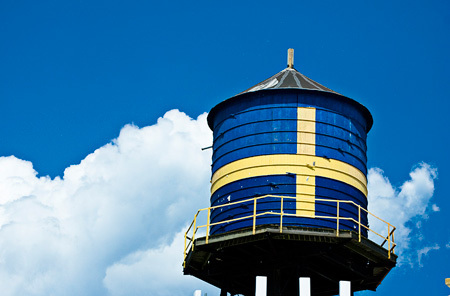 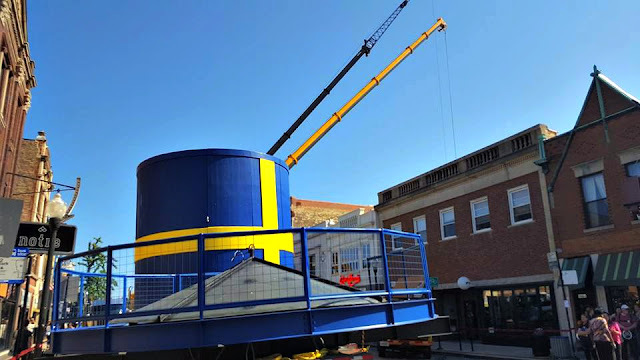 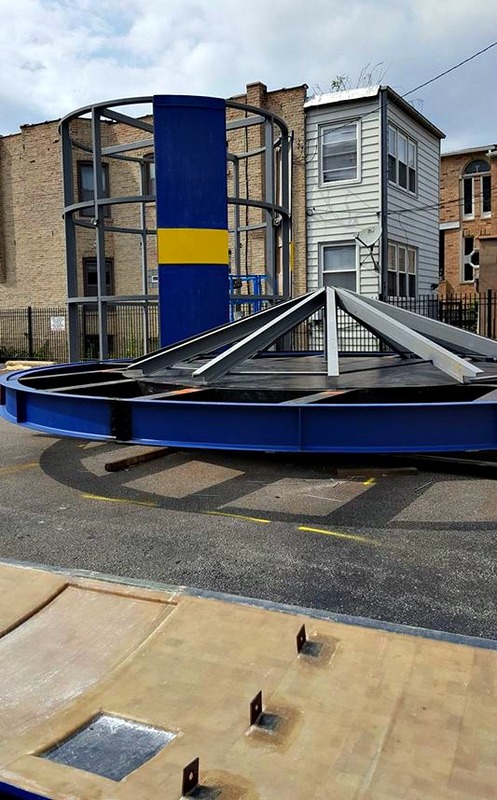 Read about the removal of the iconic water tower that was a landmark of the community. In 1868 a group of real-estate speculators (p. 712) formed the Ravenswood Land Company and purchased 194 acres of farmland in west central Lake View Township. As a note, the area west of Commerical Avenue (Hermitage Avenue) was not part of the land purchased. 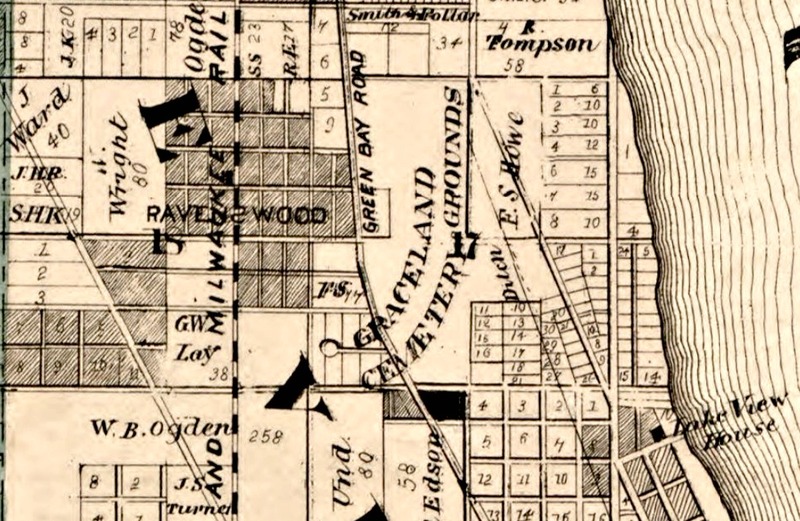 The area east of Hermitage to Clark Street, Montrose to Graceland Avenue (Irving Park Road) is currently called the community of West Graceland in the neighborhood of Lake View. 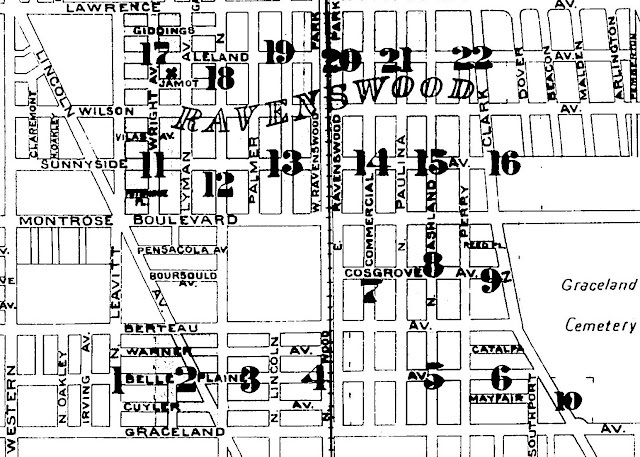 While the Ravenswood Land Company built a schoolhouse the main sewer systems and roads and most of the civic infrastructure was incurred by the residents’ own financial contributions. 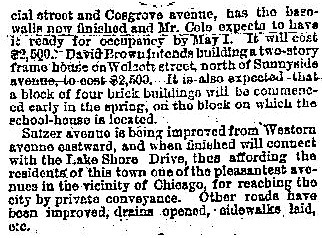 30 x 40 two story brick building on the southwest corner of Commercial and Graceland (Hermitage $ Irving Park Road). 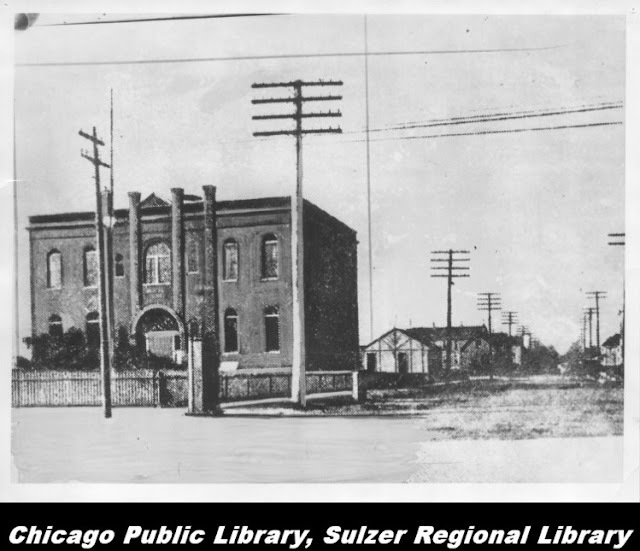 Apparently, the building included a ground floor library and reading room and the top floor a lecture hall and doubled as a concert hall. 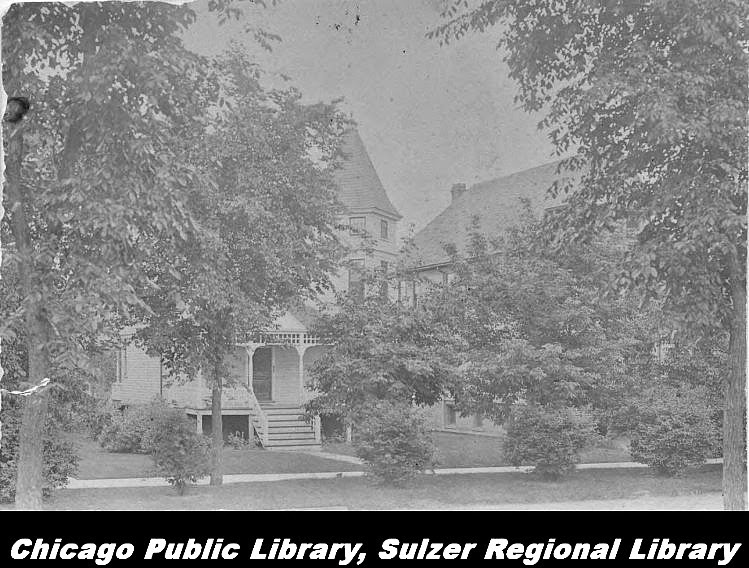 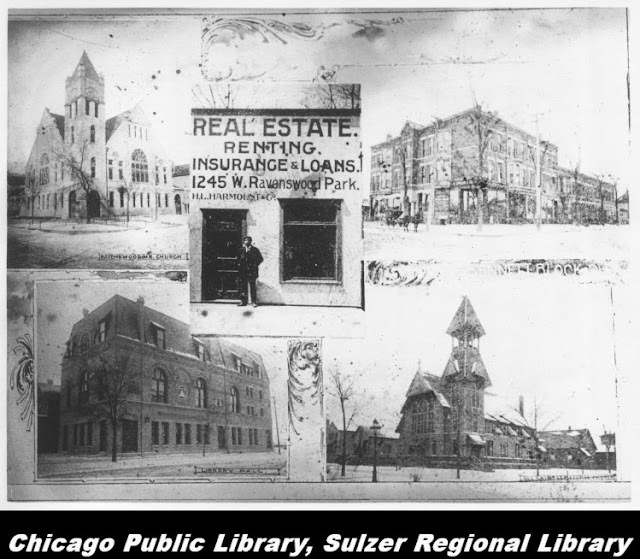 The present collection of photography, maps, and publications are located at the Sulzer Regional Library in Lincoln Square and called the Ravenswood-Lake View Community Collection. 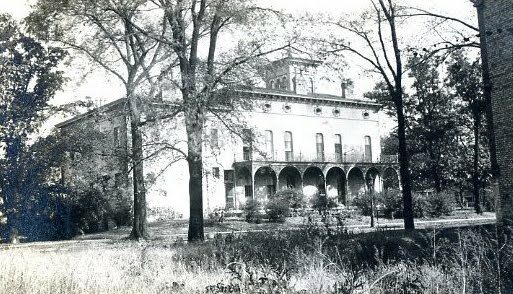 Apparently, as late as the 1920’s open ditches and muddy streets were alongside the manicured and stately lawns, gardens and homes, a work in progress. 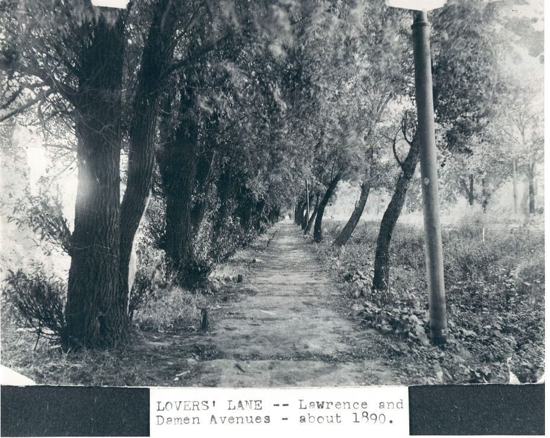 Apparently, the above image is the area on north side of Lawrence Avenue between Damen Avenue and Ravenswood Avenue. 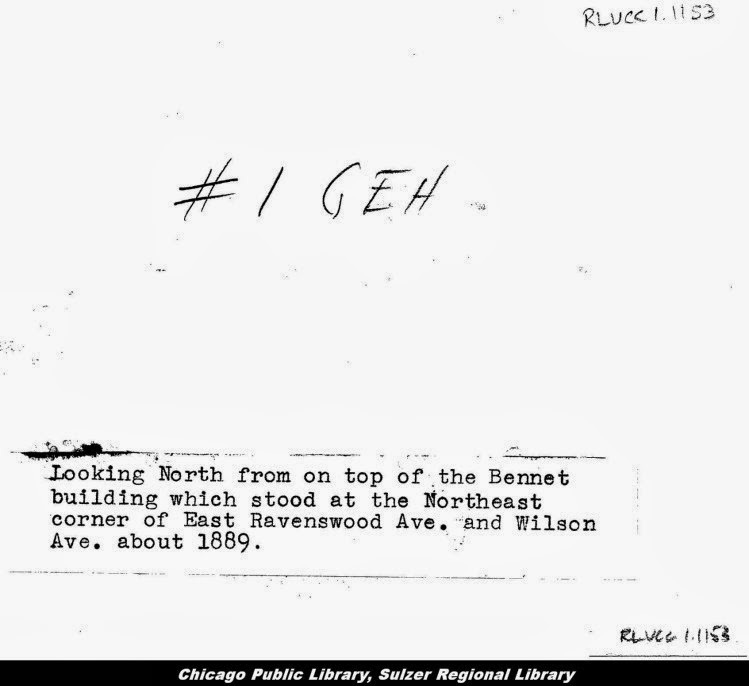 - Calumet 412. 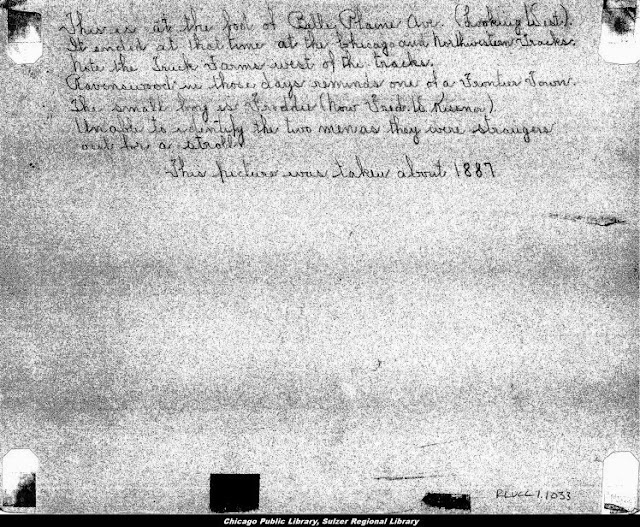 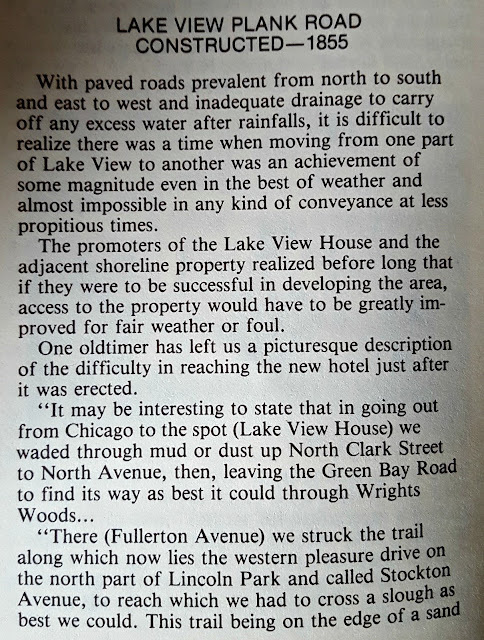 According the publication Hidden History of Ravenswood & Lake View by Patrick Butler residents got their water from the river and had a difficult time acquiring it. The township next door, Jefferson Township, wouldn't (or couldn't - funds?) 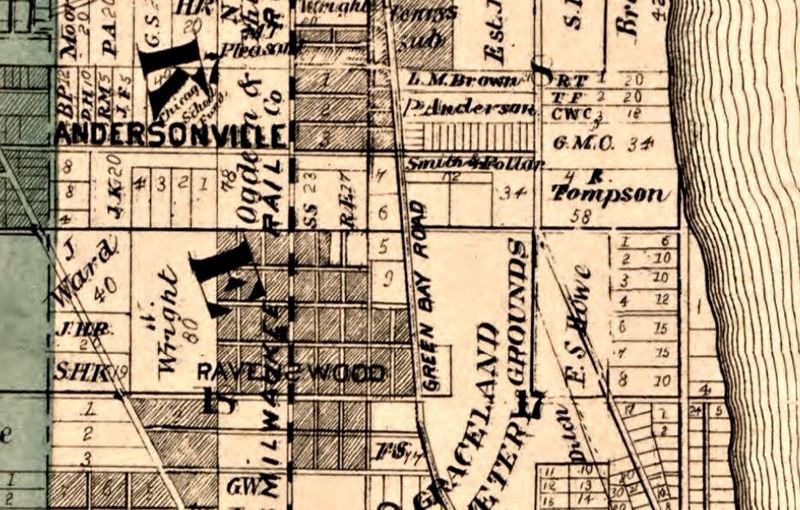 install sewers for this new area until the annexation of both Jefferson and Lake View Townships in 1889. 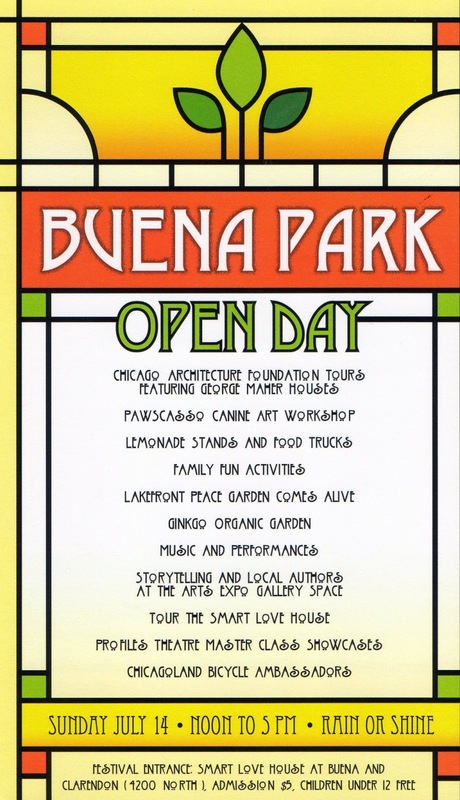 As of 1949, this community was referred to as the neighborhood of Lincoln Square. Several neighborhoods in the area claim the old Ravenswood township community. 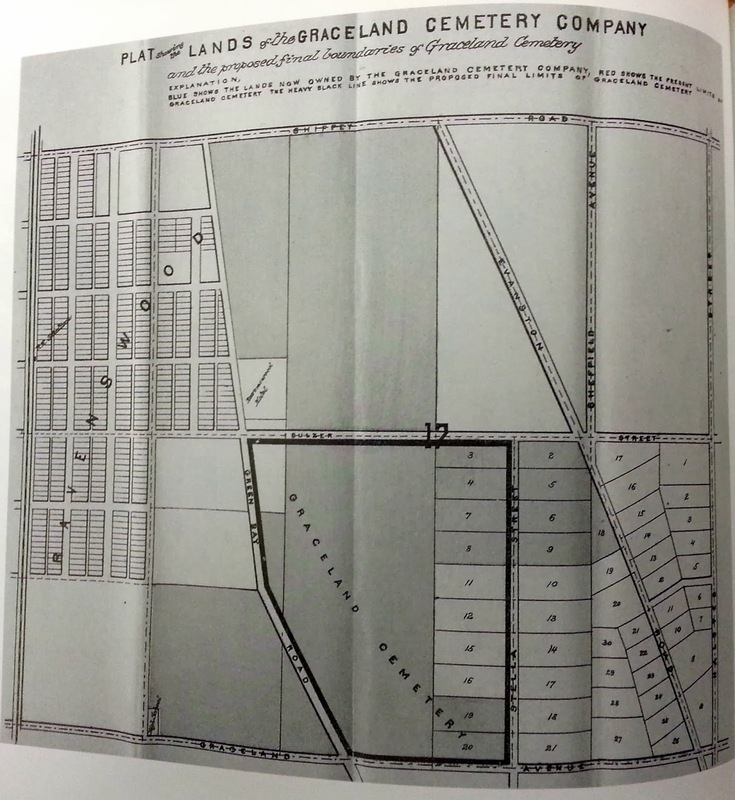 Note: Half of Patrick Bulter's book tells the tale of now fragmented former township community. 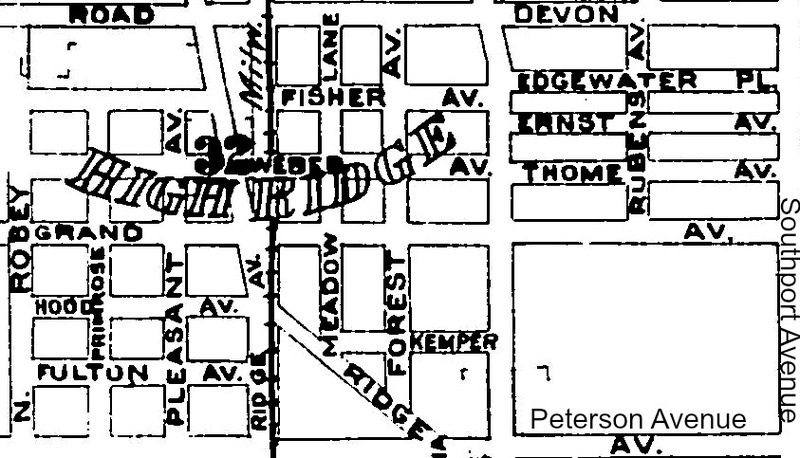 Also, read the ever changing borders of this original township community as of 2015 with the DNAifno article. 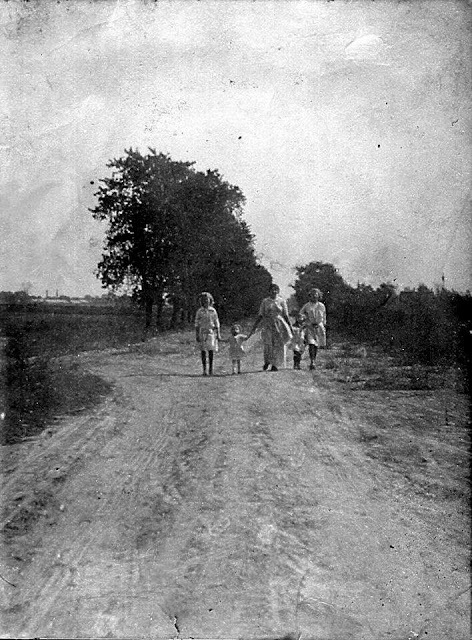 Dr. Frank Van Allen (and family), a graduate of Lake View High School & Yale University Medical School. 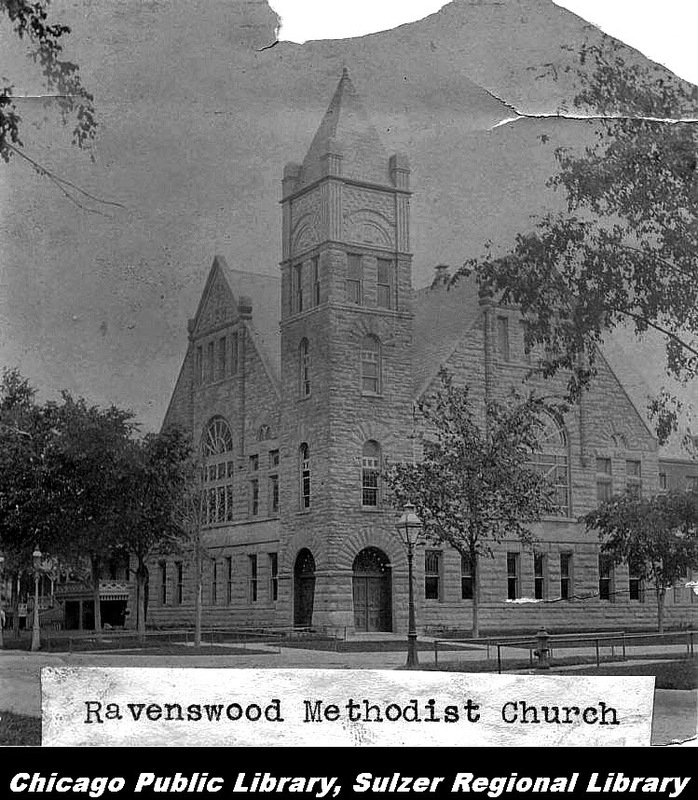 was a member of the Ravenswood Land Company. 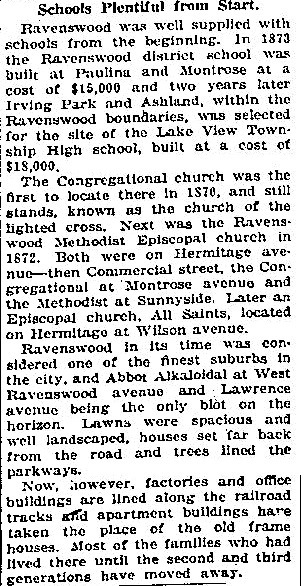 Below is a 1954 Chicago Tribune article about the neighborhood of Lincoln Square that includes parts of the original Ravenswood community. 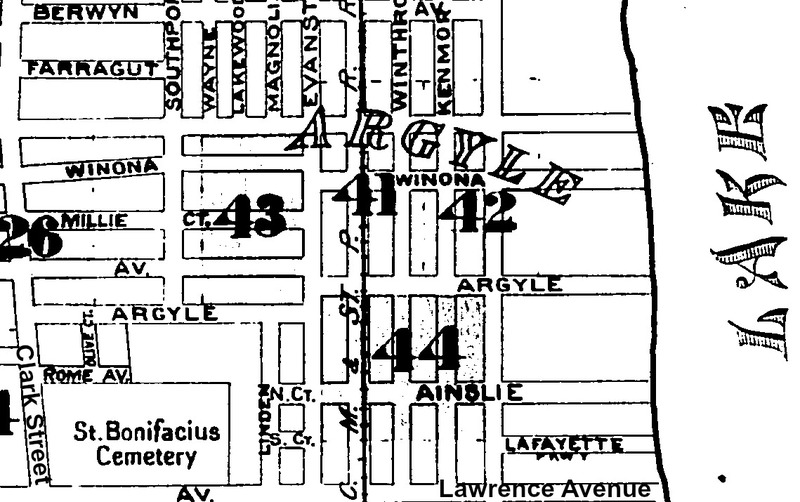 Several other neighborhoods lay claim as well such as the neighborhood of LakeView. 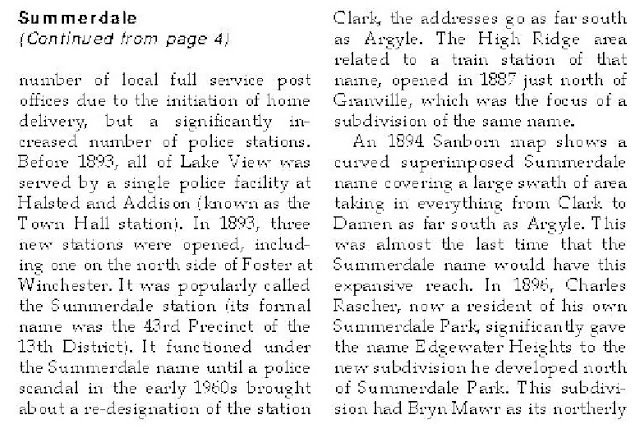 This small community had its begins in 1875 according to the Chicago Daily News article I found online. 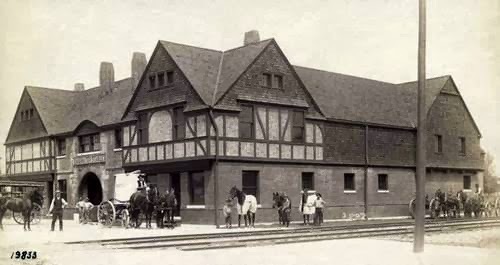 (Northwest Company rail line) train station by Foster Avenue. 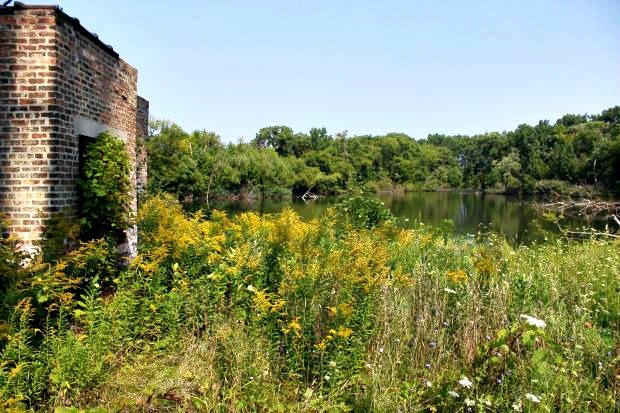 In 1887 James B. Waller, a long-time resident of the Township of Lake View began to sell of his property by subdividing his 35 acres to land speculators and developers. 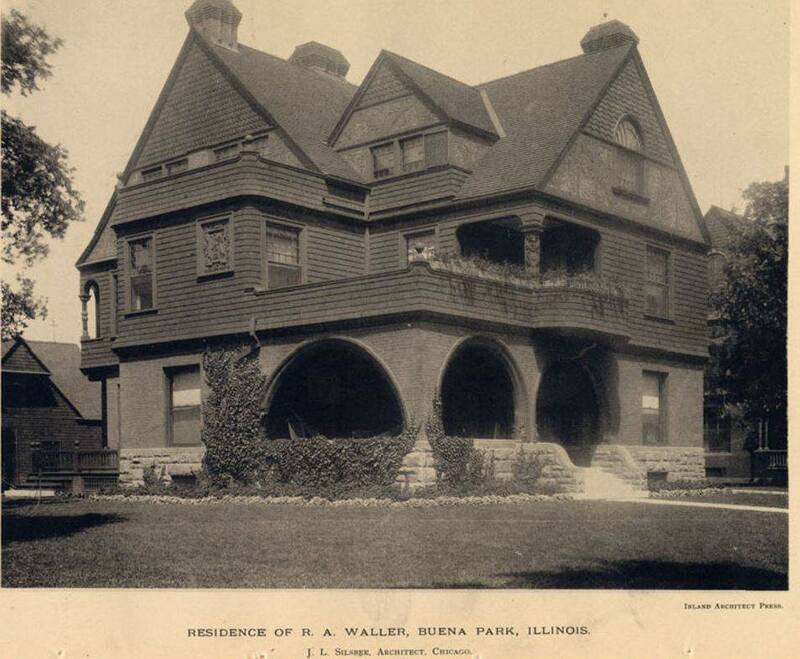 The original Waller home is now the site of St. Mary of the Lake church that was built and dedicated in 1917. 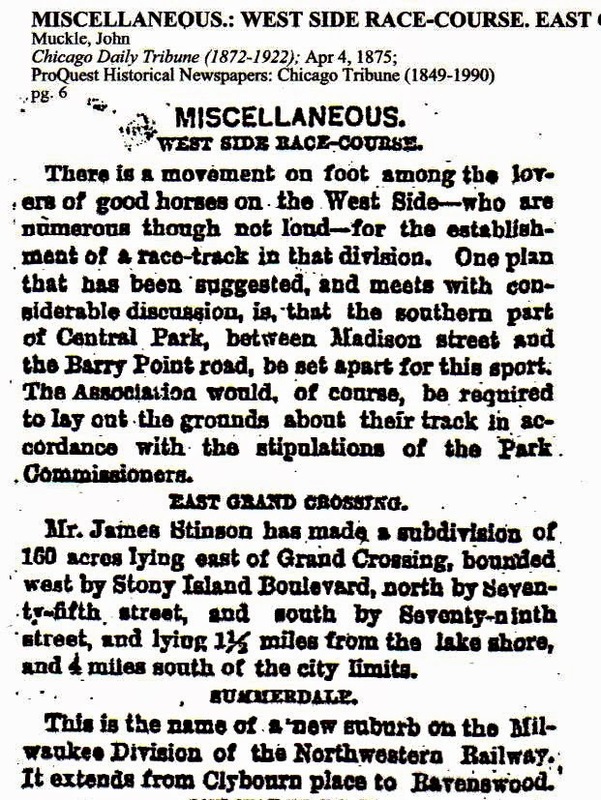 Including in the 35 acres was a "pebbled crescent shaped beach" along the lakefront (Daily Tribune 1889 article). 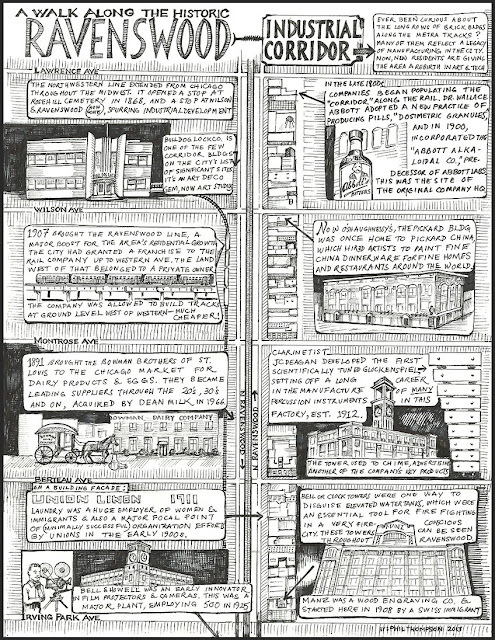 (the sole dwelling surrounded by vacant space). 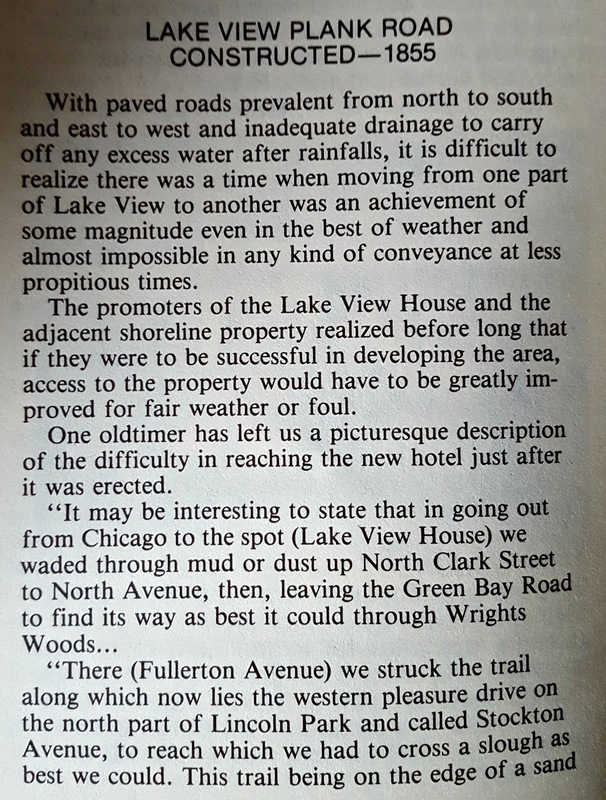 Most of his lakefront property was on a ridge that overlook the lake that had a view of a small harbor yards away of Marine Hospital near Graceland (Irving Park Road) Avenue and Lake Michigan now the home of Disney Magnet School. 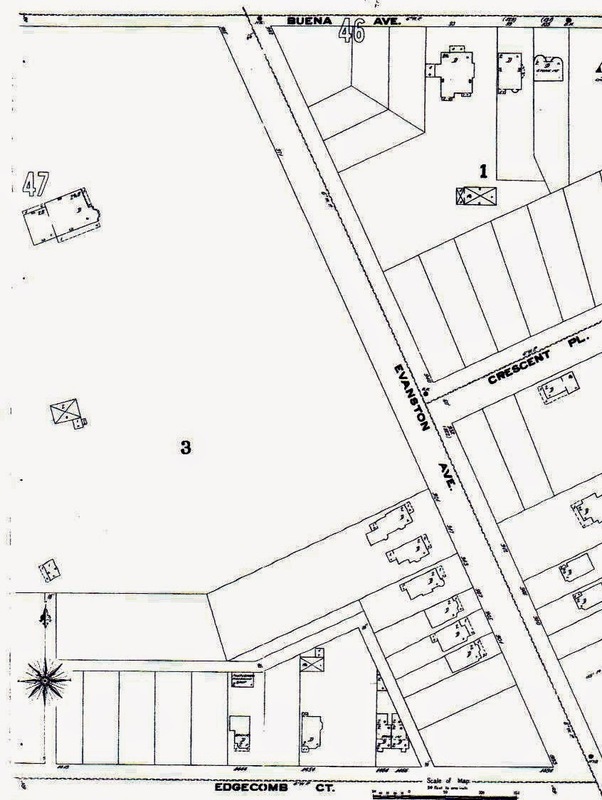 Read more about this hospital in my other post called Township Military Hospital. 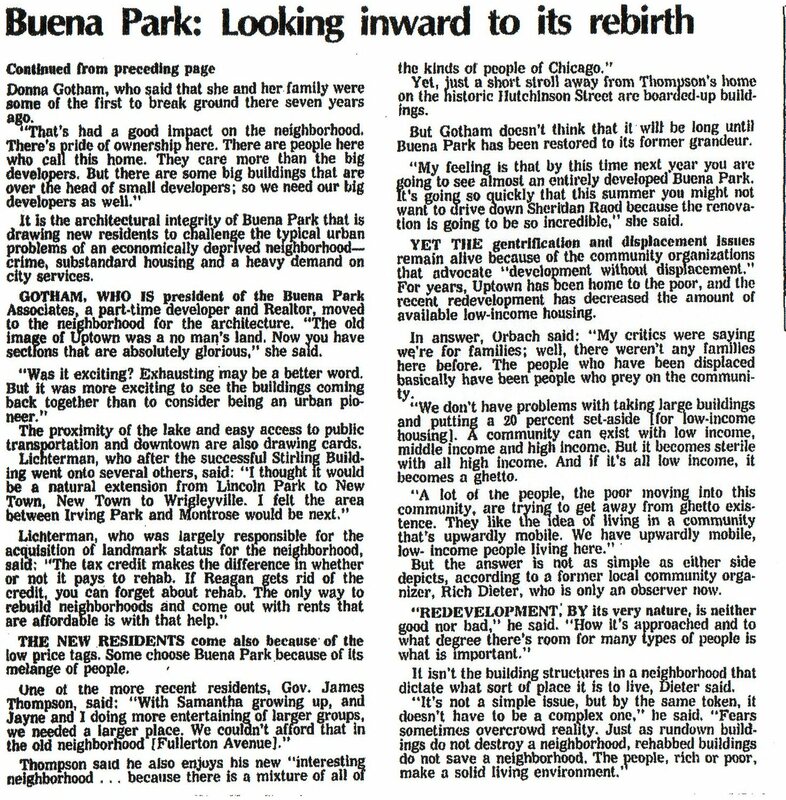 'Up yonder in Buena Park! 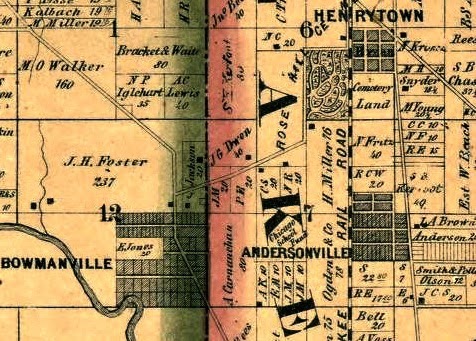 The poets' home was located in Waller's subdivided property near the intersection of Clarendon and Hutchinson Avenues near the historical Hutchinson Street District. 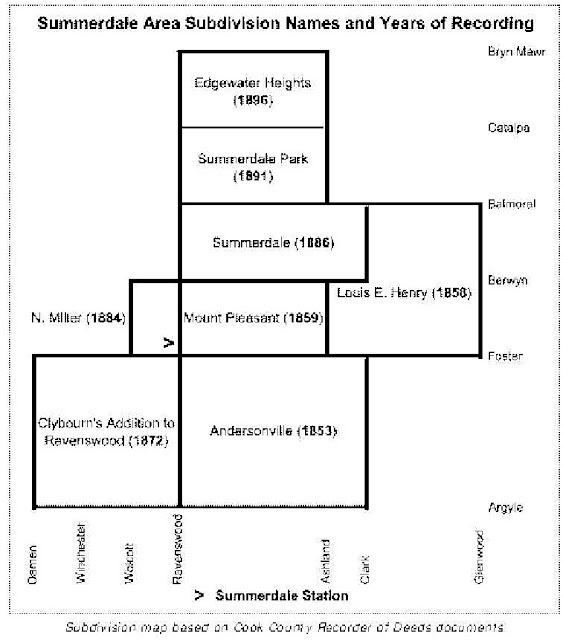 Note: The entire neighborhood is listed in the National Register of Historical Places since 1984. 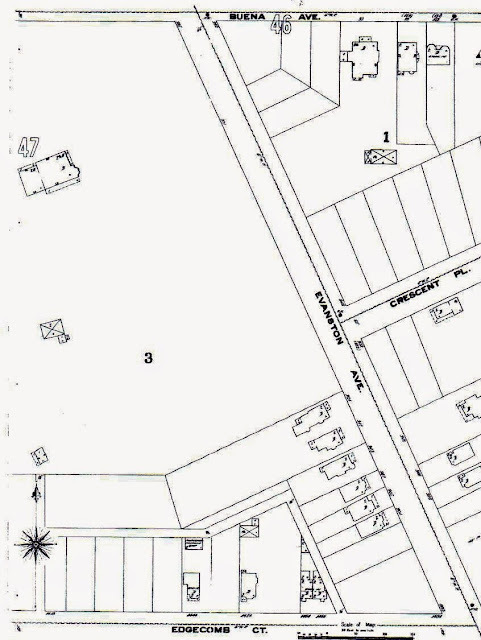 It is interesting to view the dwellings that were listed in 1984 and discover which ones survived to the present. 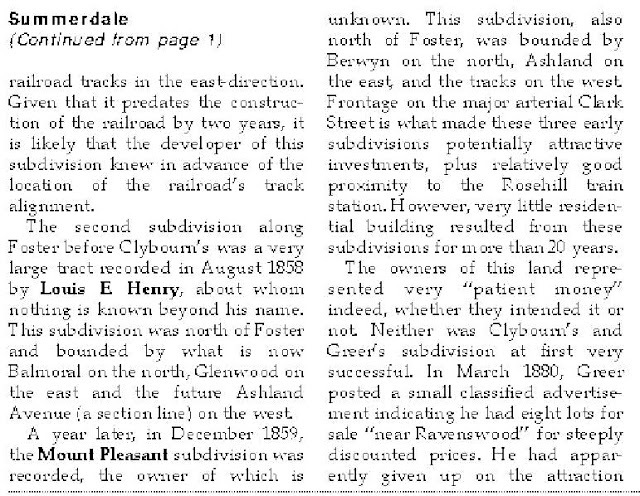 In 1885, John Lewis Cochran (p. 769) purchased vacant land to build a subdivision called 'Edgewater'. 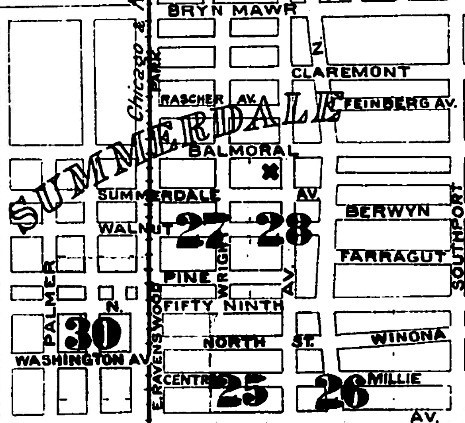 East of Broadway and bounded by Bryn Mawr and Foster Avenues, this new community was the first planned development to have paved streets, electric lighting, drainage system, street cleaning and tree trimming. 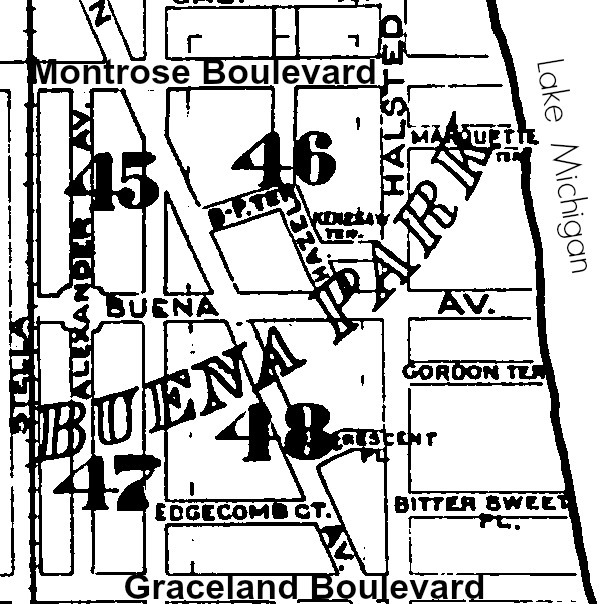 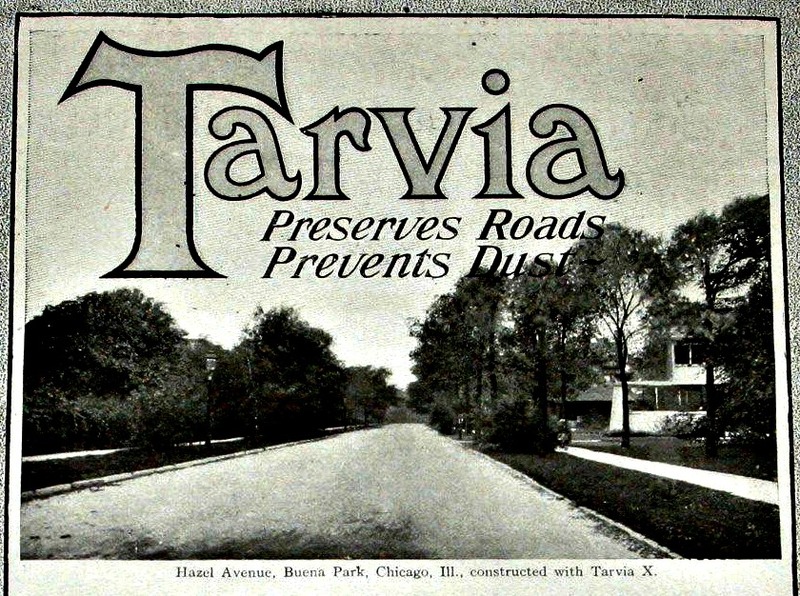 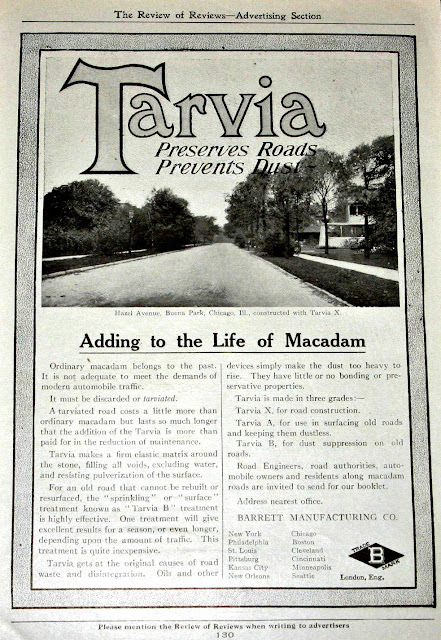 In 1885, John Lewis Cochran, a tobacco salesman for the McDowell Tobacco Company of Philadelphia began to purchase land along the lakeshore from Foster Avenue (once called 59th Street in the Township of Lake View) to Bryn Mawr, a street he named. 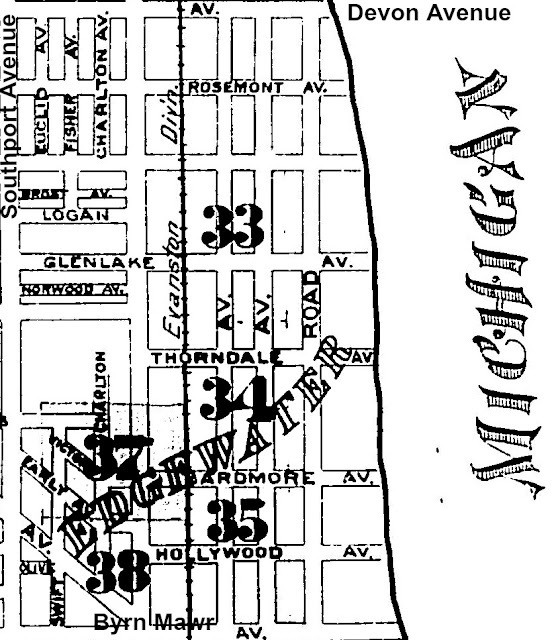 This land west of what is now Sheridan Road was his first purchase and he named it Edgewater. He had a vision of a suburb much like the suburbs of Philadelphia that extended out from that city along a railroad called the Main Line. 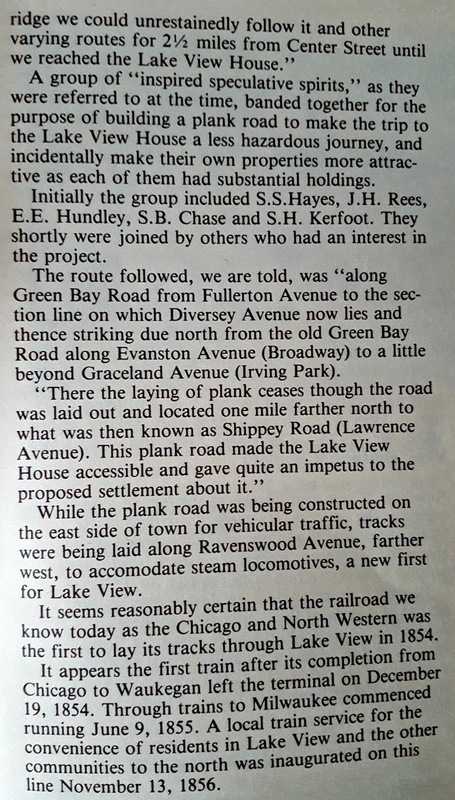 The train line that ran through Edgewater was the Chicago, Milwaukee & St. Paul line. 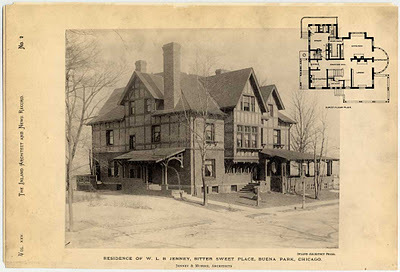 Cochran persuaded the railroad to open a station at Bryn Mawr which he had built of wood and stone in the Eastern architectural style called Shingle Style. 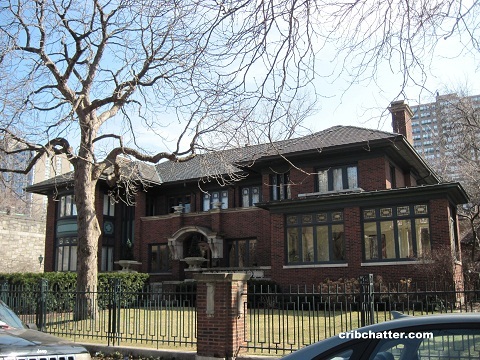 At the same time he built a large recreation and business building he called the Guild Hall in the same style. 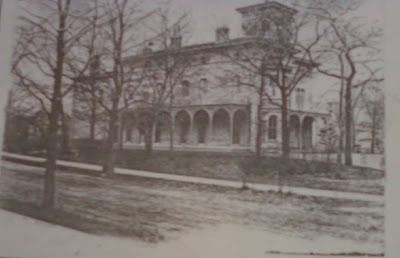 He had engaged an architect, Joseph Lyman Silsbee to design this and some houses which were built on Kenmore and Winthrop. 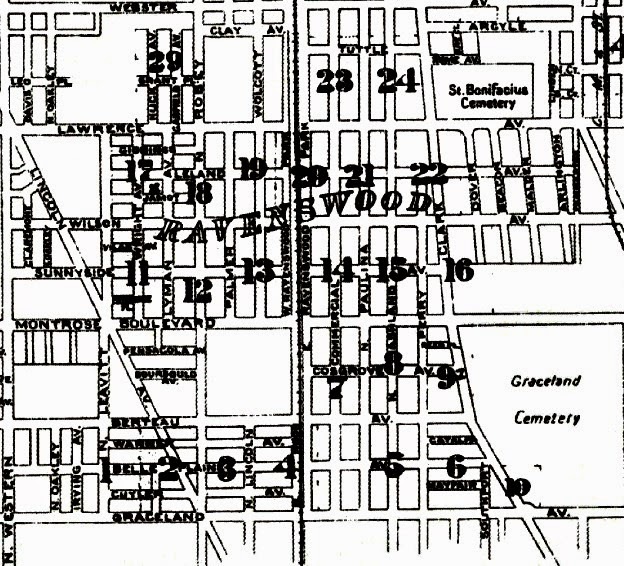 Cochran subdivided the land and improved the area with sewers, stone sidewalks, macadam streets and electric power. 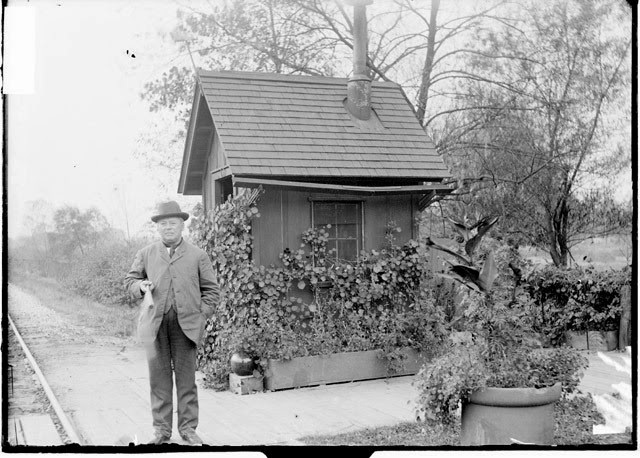 He offered no-interest loans and advertised this community in the newspapers. 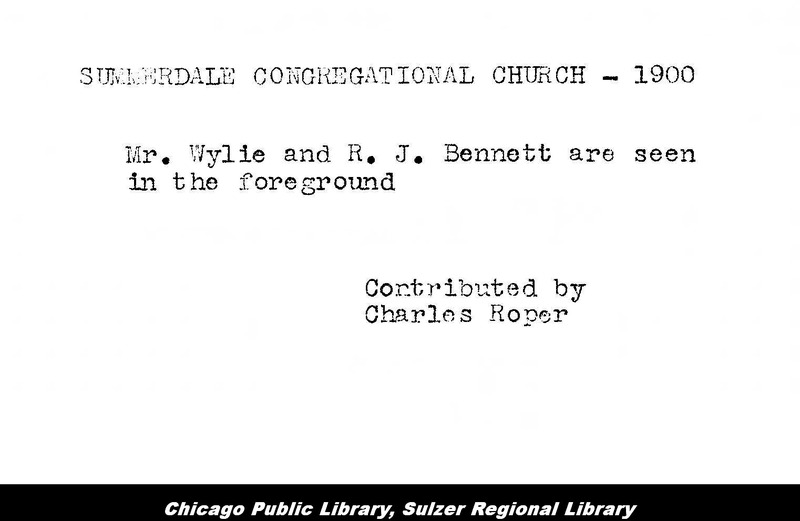 He maintained an office in the Loop and one at the Guild Hall. 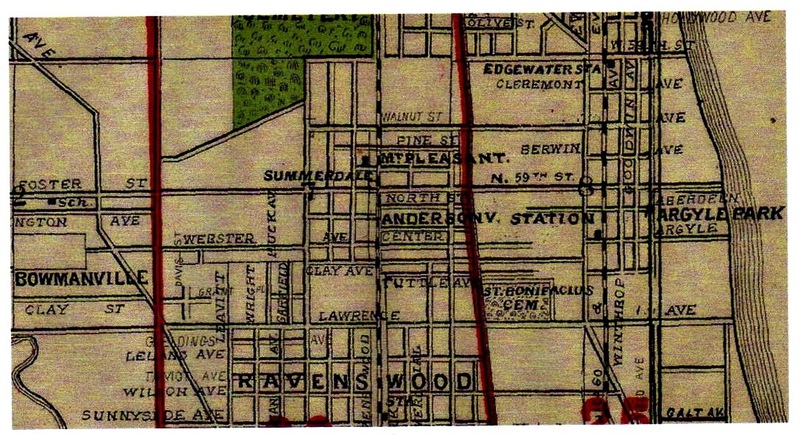 Although he had persuaded the railroad to stop at Bryn Mawr there were only a few trains each day. 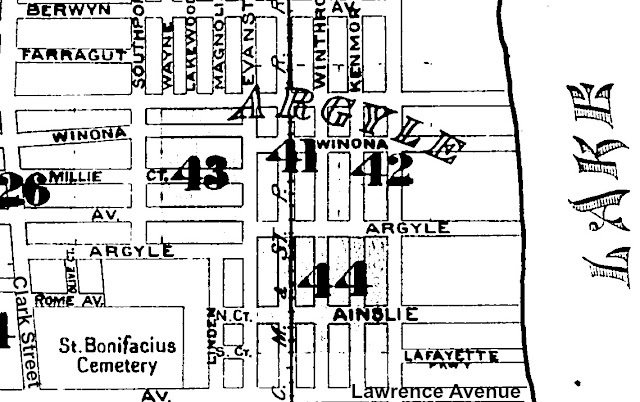 He began by building homes along Winthrop and providing electricity to them so that those riding by the community would recognize it as an appealing place. 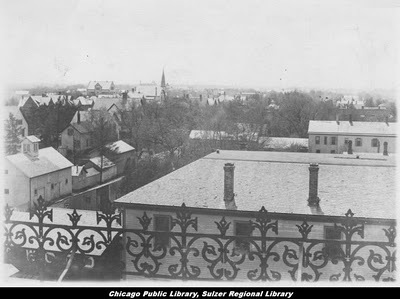 The lots were fifty feet of frontage along the streets and many of those attracted to the area bought at least two lots; some purchased as many as four. 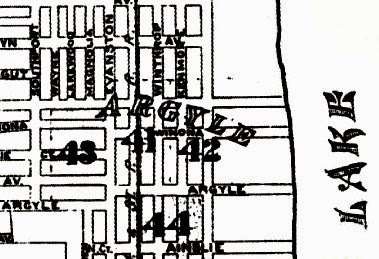 In 1887, Cochran completed the purchase of land north of Bryn Mawr to a point in the middle of the block between Ardmore and Thorndale. 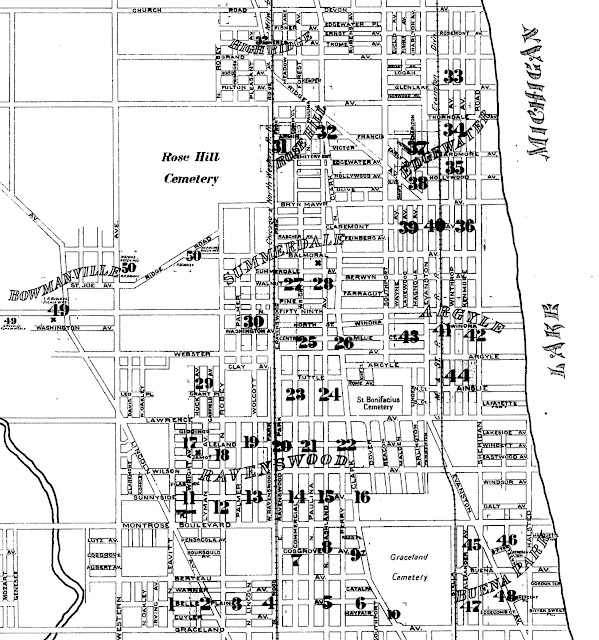 Cochran named these streets as well as Berwyn, Balmoral and Claremont, now Catalpa. 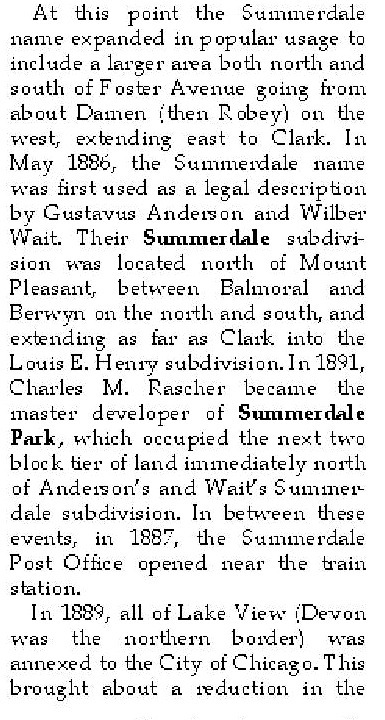 In his next addition in 1889 he added the land from the first addition north to Devon with streets named Glenlake, Grand and Rosemont. After a short time working with Silsbee he found that many buyers wanted more options in the designs of their homes. 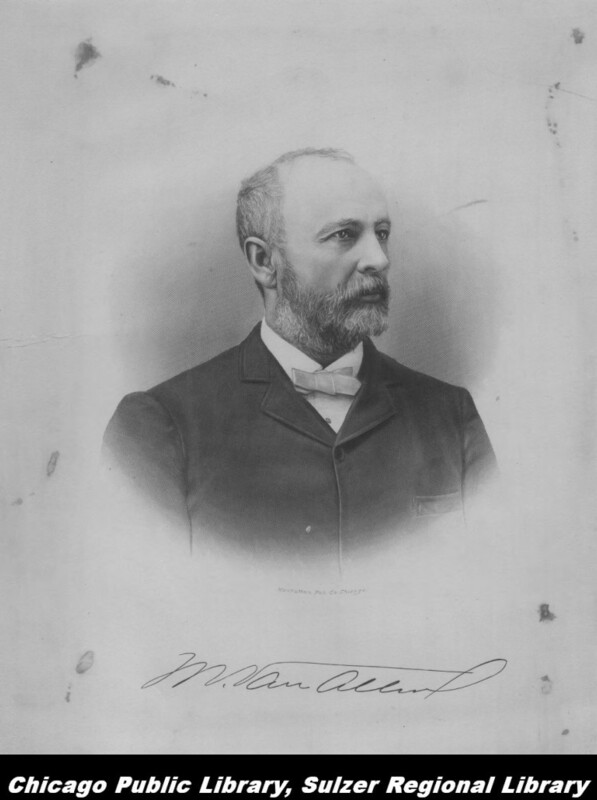 He fired Silsbee and hired George Washington Maher as lead architect. 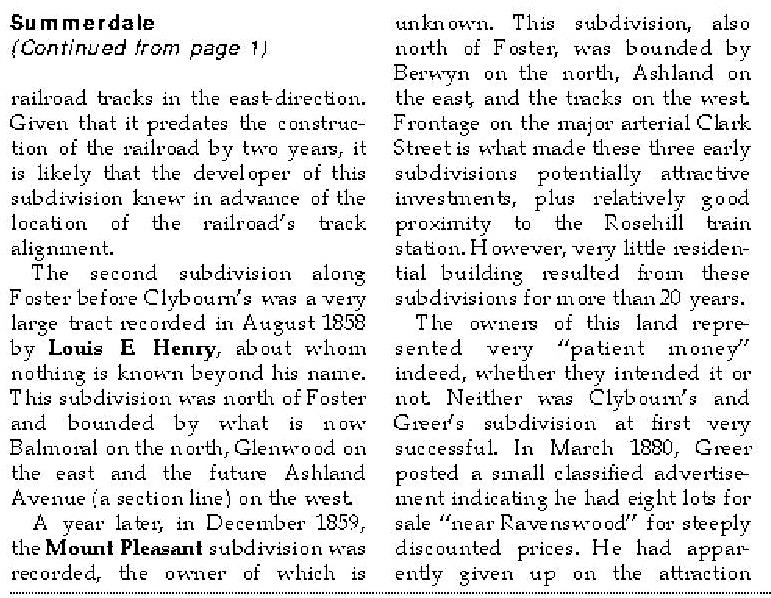 Maher worked in the area for many years though any homes he designed for Cochran did not have his name as architect. 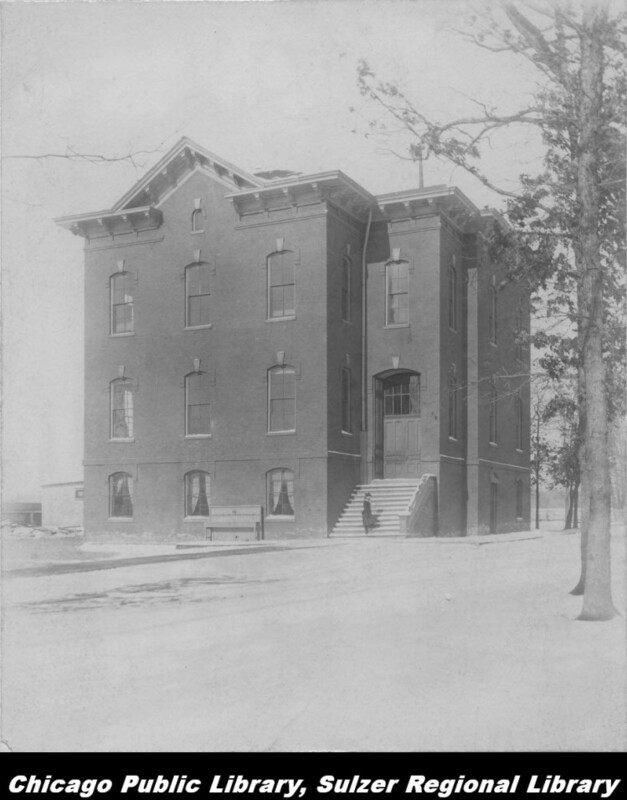 Cochran was the holder of the building permit. 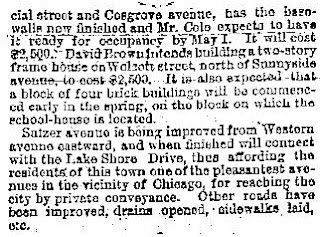 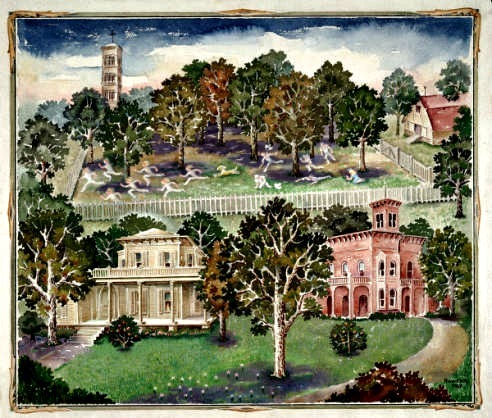 Every lot that Cochran sold had a covenant on it with a restriction that the buildings could only be single family homes. 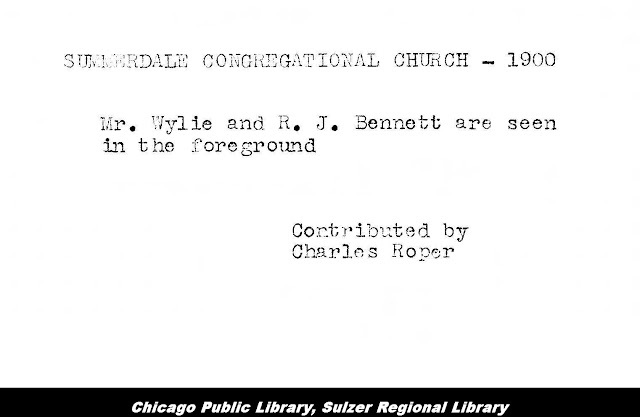 The length of time for this restriction was 20 years. 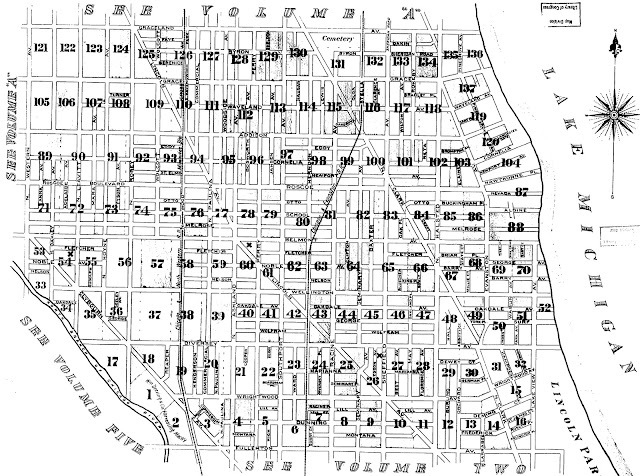 When homes were resold after 20 years the restriction was lifted. 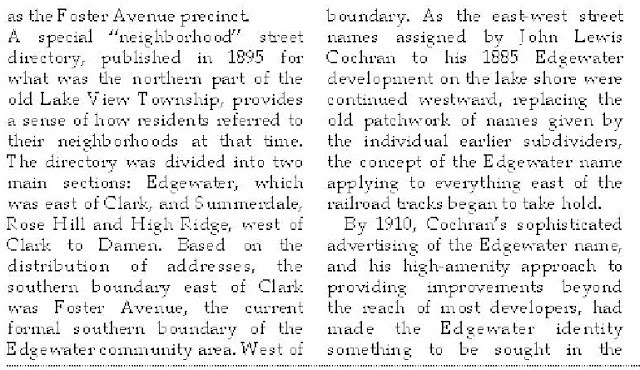 This time limit on the restriction was the factor that changed Cochran’s beautiful suburb into the urban area it is today. 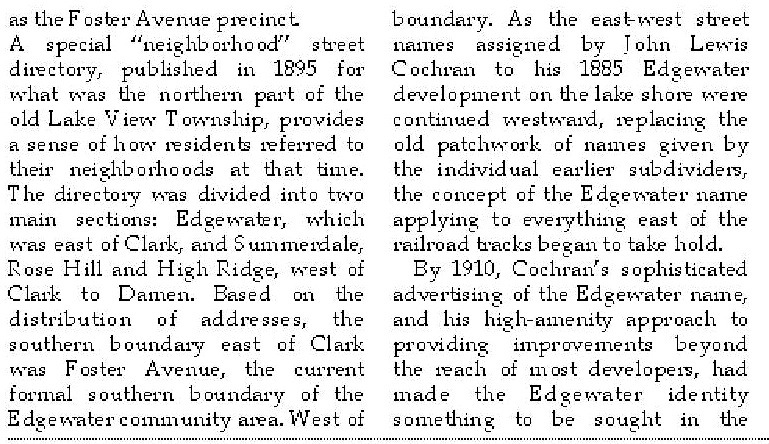 Cochran himself lived to see this transformation which began in 1908 when the train tracks were elevated and Edgewater was connected by the “L” system to downtown Chicago. 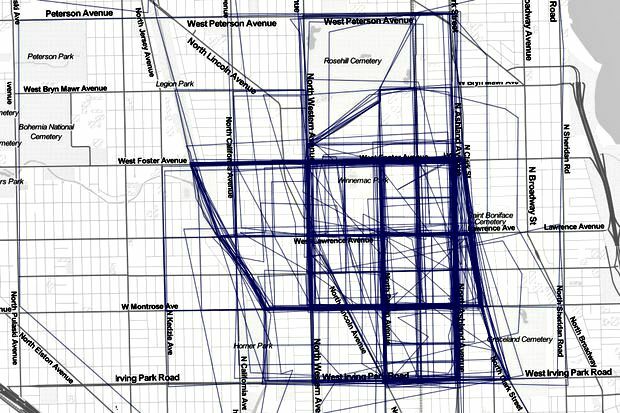 That connection created a pressure for more housing units and flats as more and more people moved to Chicago. 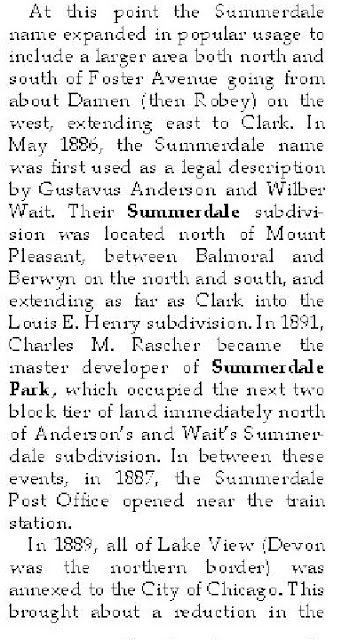 Even as some builders were building flat buildings other were building large single family homes along the newly opened section of Sheridan Road south of Bryn Mawr. 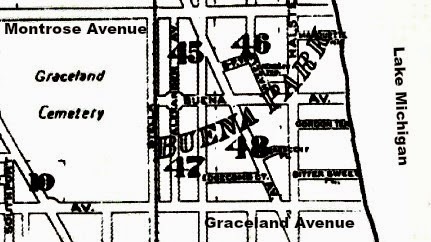 Years later some owners began selling their side yards to builders of apartment hotels and the density of the area increased. 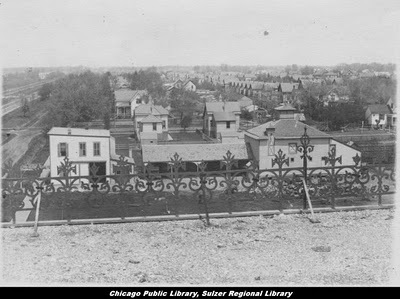 On some of the remaining empty lots large apartment homes were built. 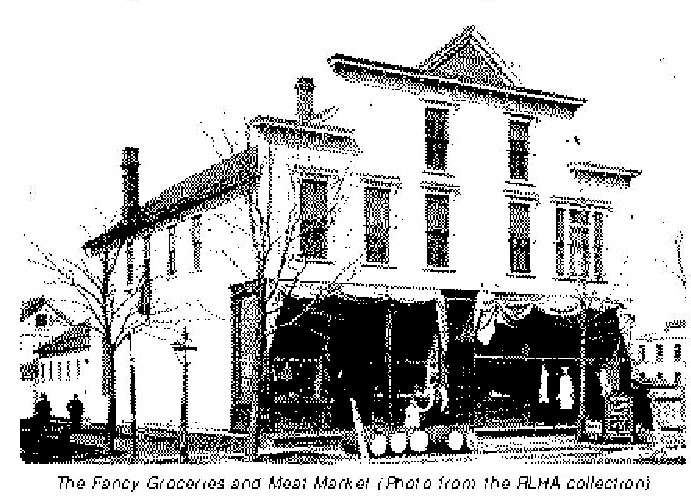 The units in these buildings had three to five bedrooms and maid’s quarters. 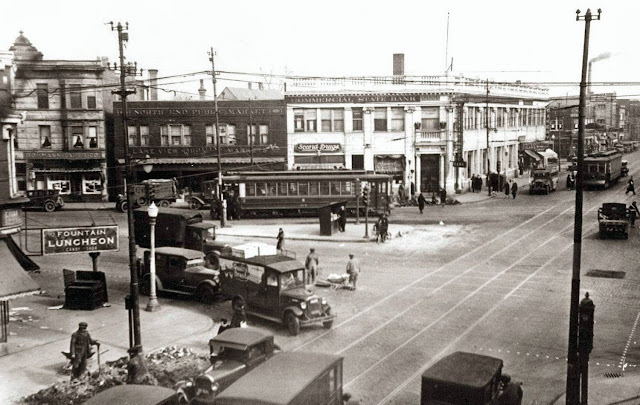 By the 1920s the variety of housing in the area ranged from large single family homes and two flats to large apartment homes and apartment hotels. 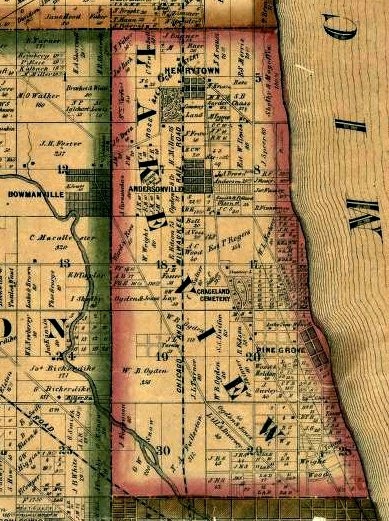 Cochran’s suburb of Edgewater became an urban neighborhood. 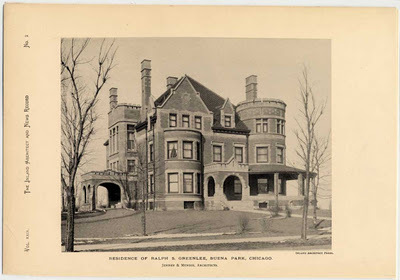 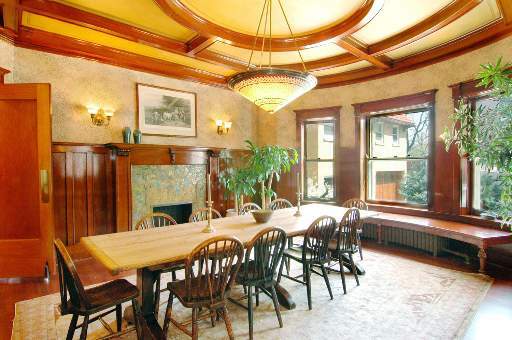 In 1886, the first ten houses and a commercial building called the Guild Hall was built along with a train station at Bryn Mawr to offer transportation south to Graceland Avenue (Irving Park Road) along Evanston Avenue (Broadway Avenue) to Diversey Parkway. This community was known for its horse stables and 'horse and cycle clubs' such as the Edgewater Stables and the Saddle and Cycle Club. Lake View & Jefferson Townships with the community of Bowmanville located on both sides of Western until the annexation of both townships to the City of Chicago. 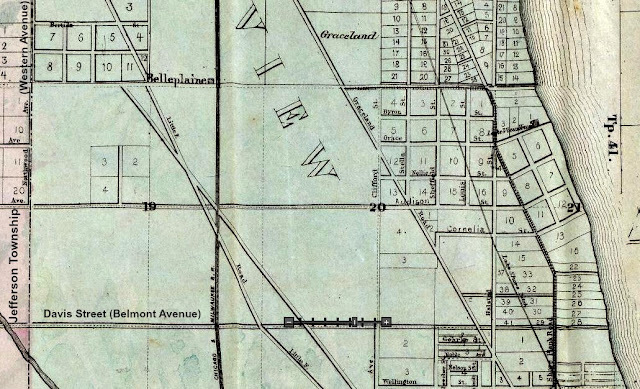 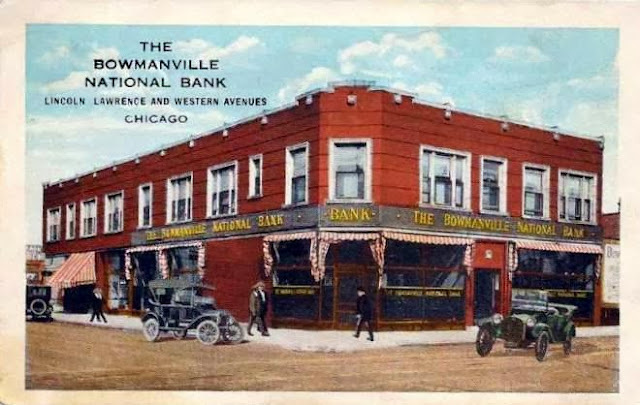 After the establishment of official neighbors by 1930 the neighborhood of Bowmanville was located east of Western Avenue. 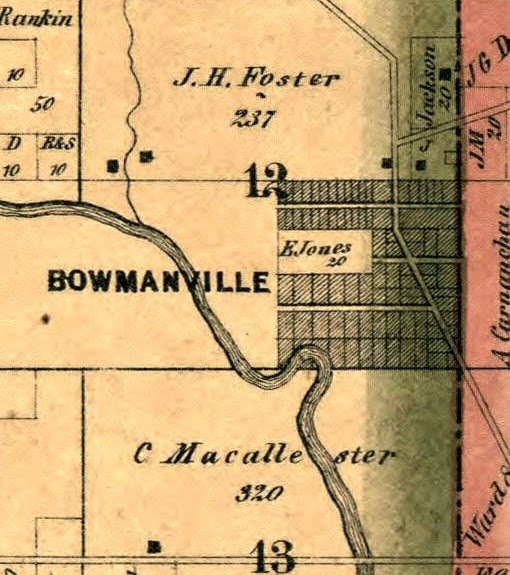 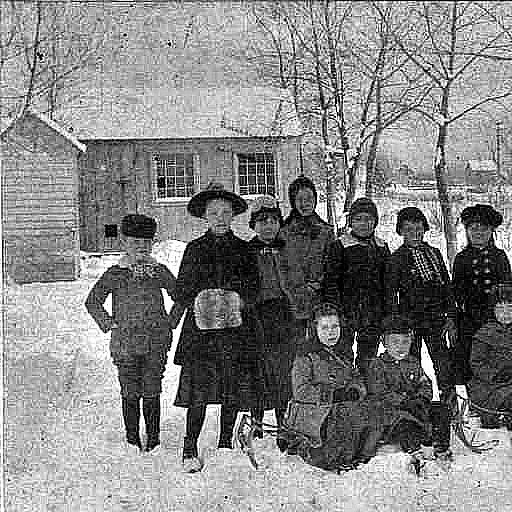 Bowmanville as a community was originally located around Foster Avenue and Western Avenue was established in 1850's by Jesse Bowman, a local lodge keeper. 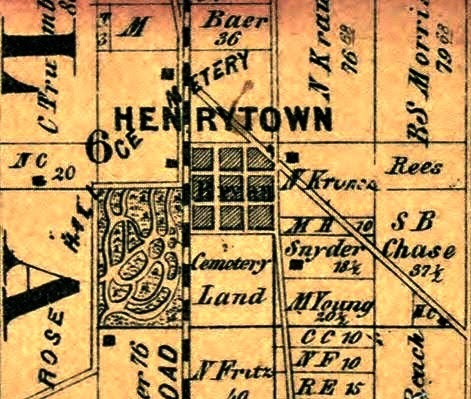 Although his claim to the land was later found to be illegal, it did not prevent the area from becoming a bustling settlement. 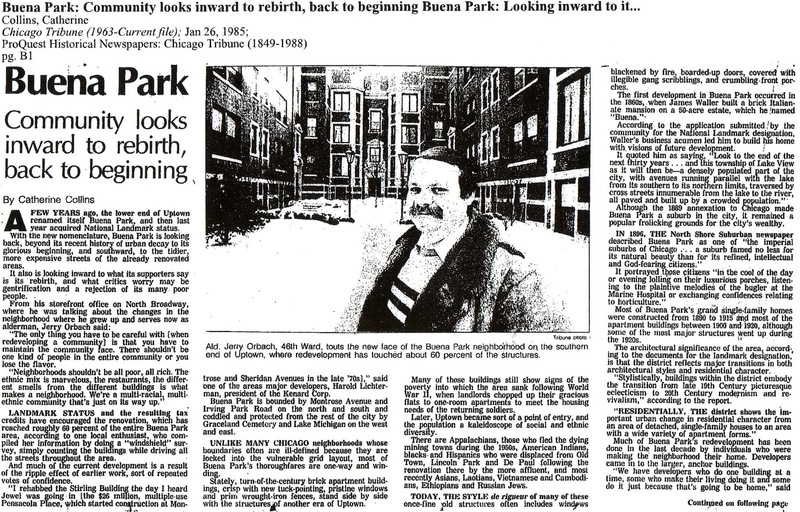 Jesse Bowman was a man who was passionate about getting things done fast -- and not necessarily by the books. 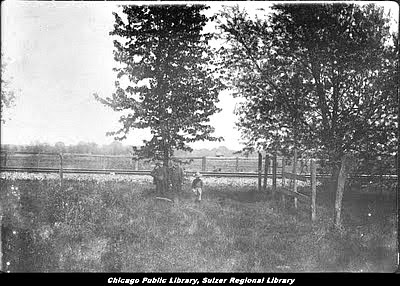 In the early 1850's he unofficially cultivated the dirt paths through the forest near present-day Foster and Ravenswood avenues. 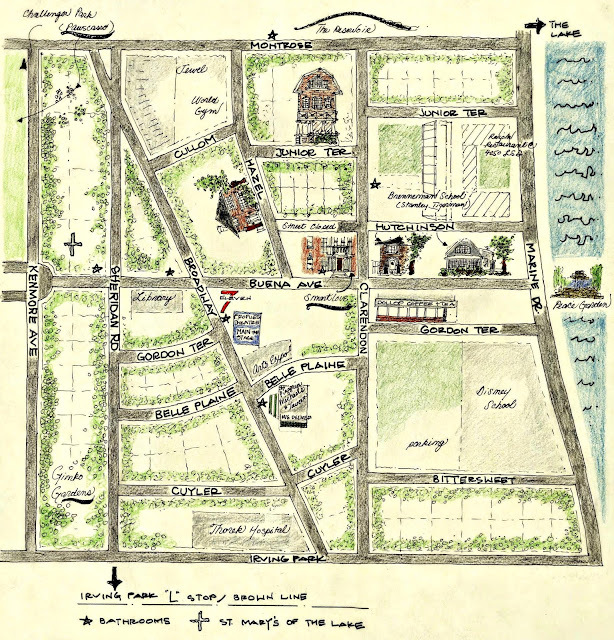 He laid claim to many of the imaginary plots in the area without actually owning any of the property. 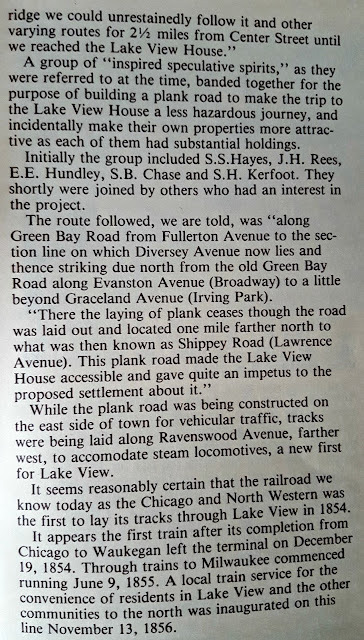 He then sold the land 'that wasn't his" to unwitting buyers, and the later skipped town or according the publication Hidden History of Ravenswood & Lake View by Patrick Butler or disappeared "any of the victims had anything to do with Bowman disappearance". 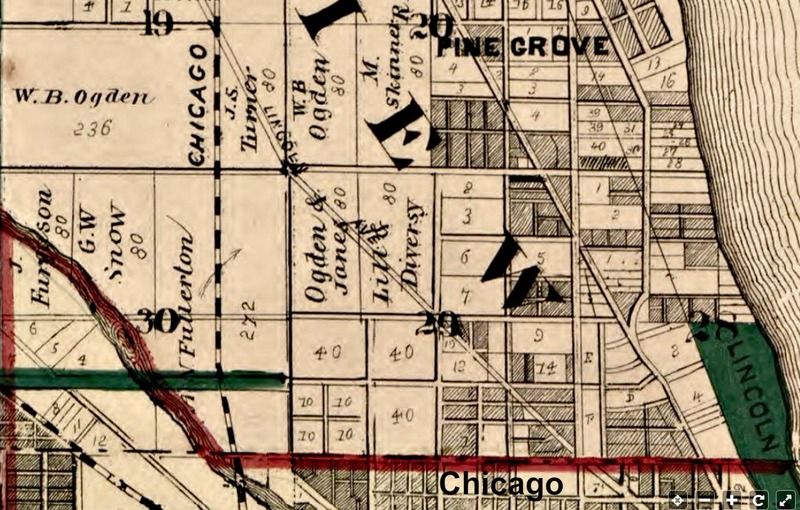 After the legal issues were resolved the area became a stopping point for farmers delivering their goods to markets in Chicago. 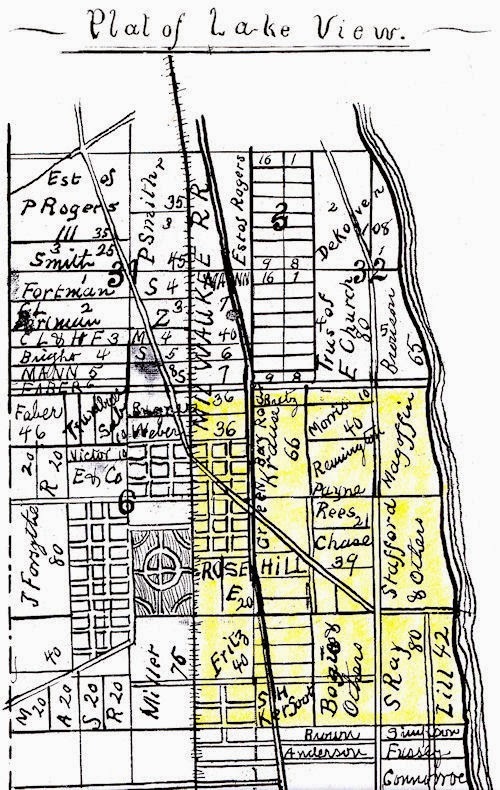 Numerous saloons and taverns sprang up, among them an establishment owned by Hiram Roe, locate on Roe’s Hill. The original name of the area was later misspelled Row’s Hill and then Rose Hill, which became the name of the train depot in the community. 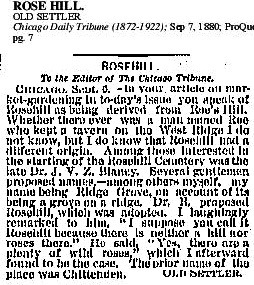 The name eventually became Rosehill, as in Rosehill Cemetery. 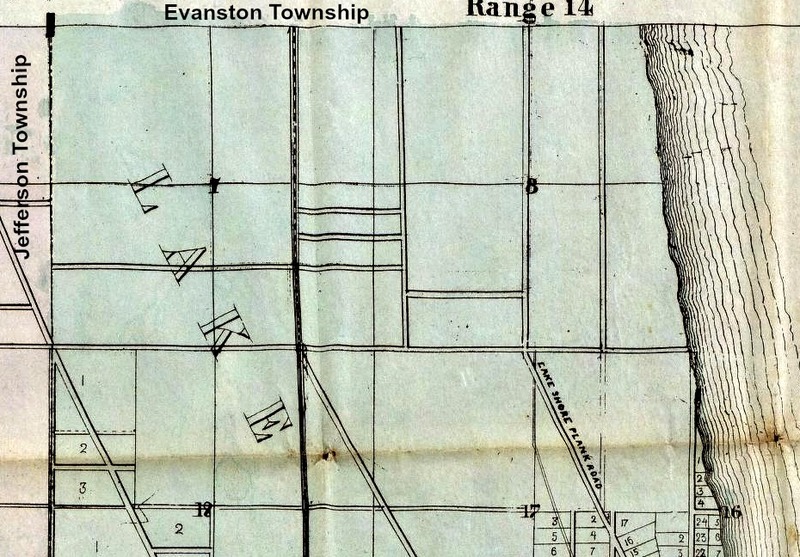 This was one of the earliest communities before Lake View Township & Evanston Township were once part of the first township in northern Illinois - Ridgeville Township 1850-1857. 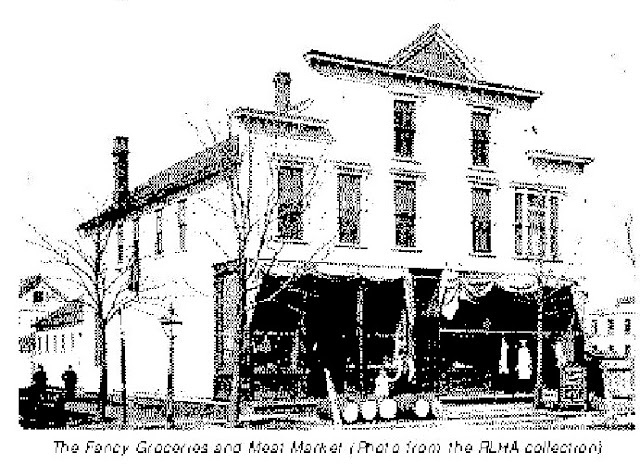 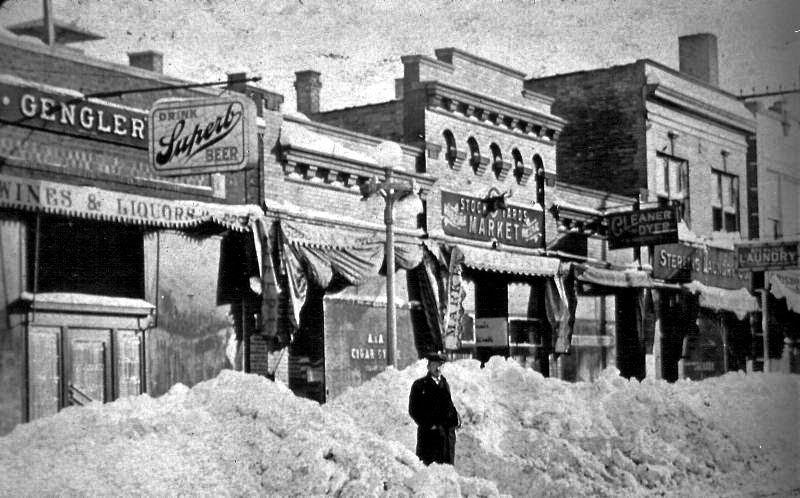 The grocery store was situated on the northeast corner of Foster and Wolcott Avenues -1860's? 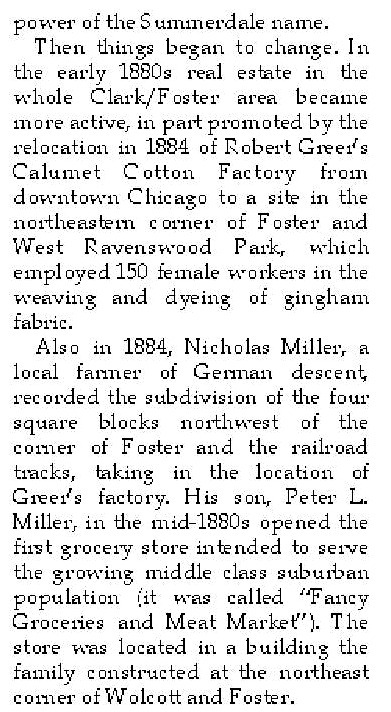 Other businesses included lodges/roadhouses, carpenter shops (for coffins), stone mason shops (headstones) greenhouses (flowers and vegetables) to name a few. 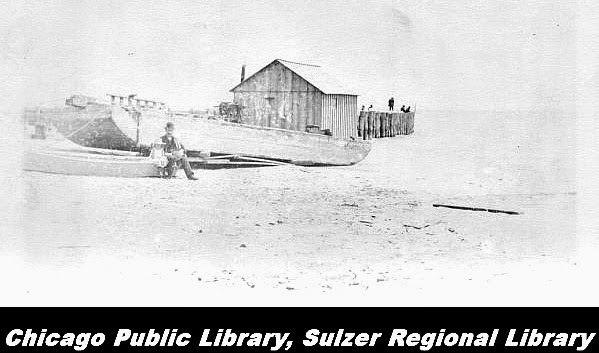 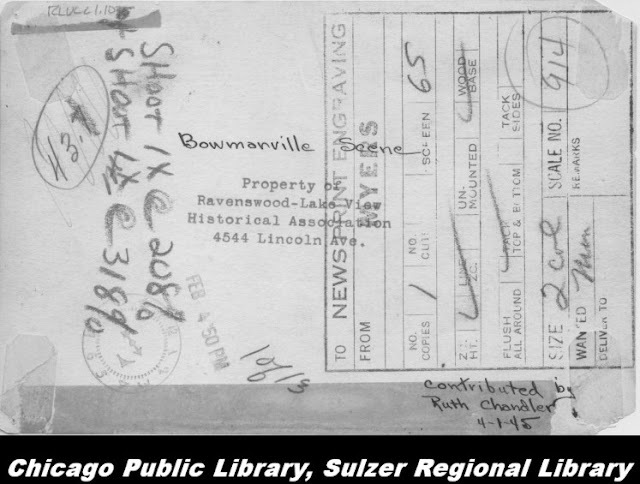 This was the same time that a doctor from Switzerland and his family located south of Bowmanville; later to regarded as the official founder of Lake View Township - Conrad Sulzer. During this time period Chicagoans who lived in then dense communities of the city began to move where the land was rural and inexpensive. 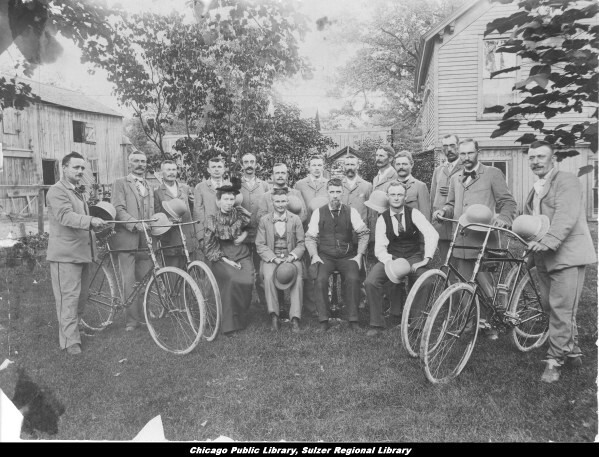 This community was one of the three. The above aerial photograph showing farms, homes, streets, telephone poles, and open land were apparently the L.A. Budlong Company, a first successful commercial greenhouse in the township. The company at one time occupy 400 hundred acres of land. 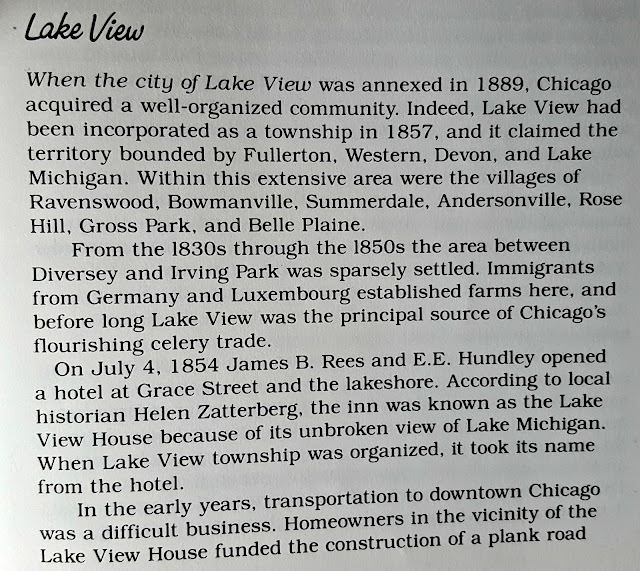 According the publication Hidden History of Ravenswood & Lake View by Patrick Butler "the workers were originally paid at the end of the day in silver dollars, known as 'Budlong Dollars' or simply 'Budlongs' ". 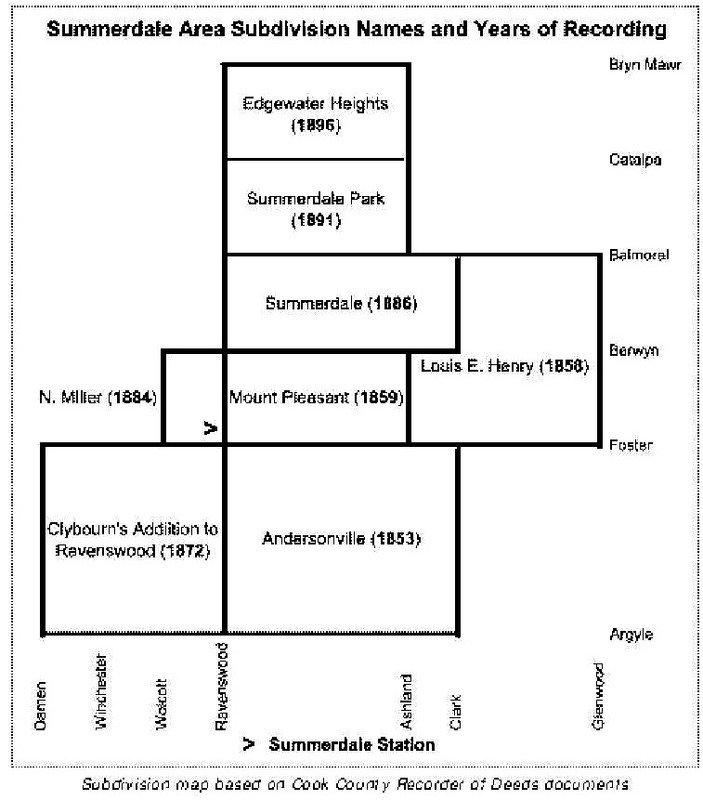 Also, the book mentions that "by the turn of the century, they had between eighteen to twenty greenhouses described by one visitor as a 'virtual village of glass'"(p.122). 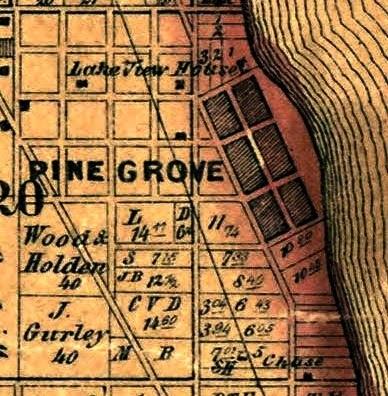 The remaining greenhouses remained as late as 1988. 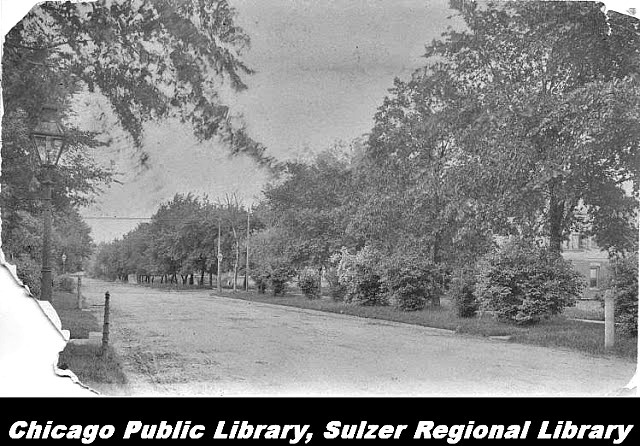 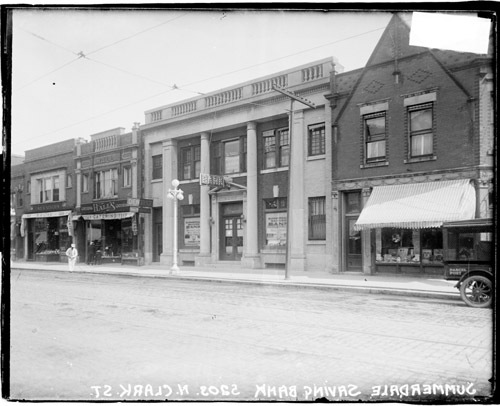 “This is Devon Avenue in 1914 looking east from about Claremont, just east of Western Ave. 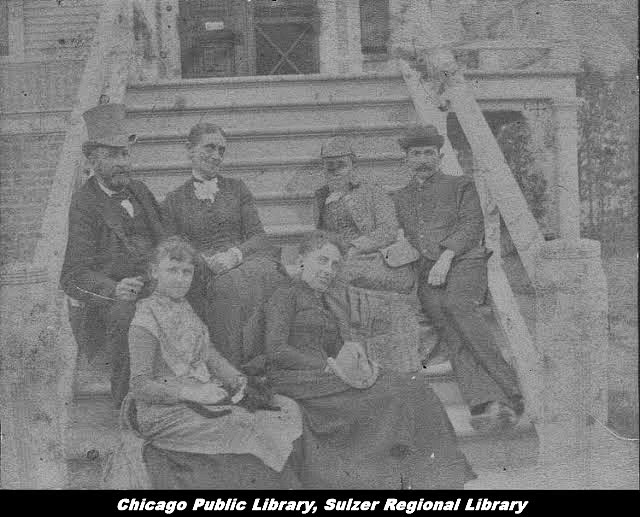 The people are from L to R my great aunt, my Mother, my grandmother, Uncle, and another grand aunt. 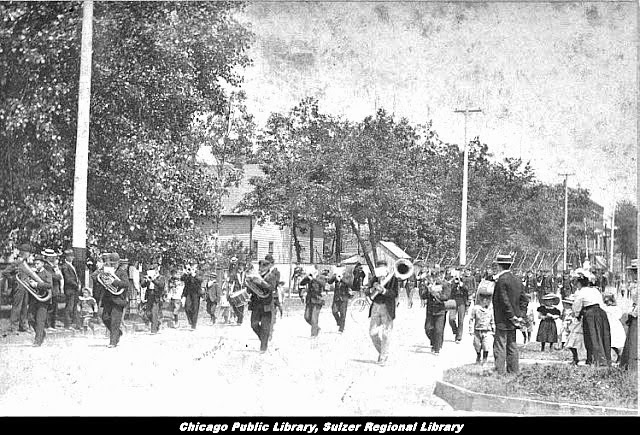 They are walking from Angel Guardian /St Henry’s church (steeple way barely visible in the background) back to a truck farm on the SW corner of Rockwell and Devon where my grandparents worked. 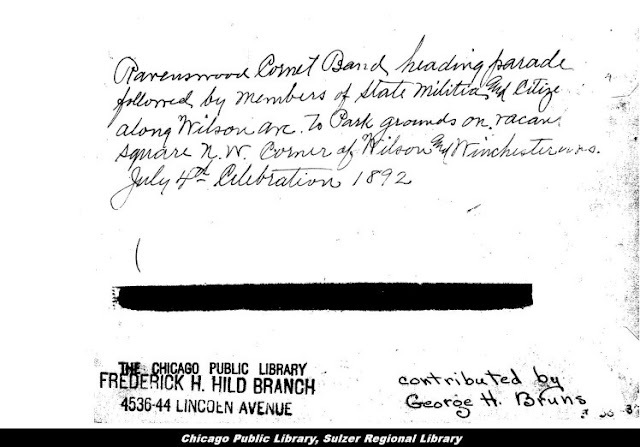 Follow the conversation on Facebook of this photo! 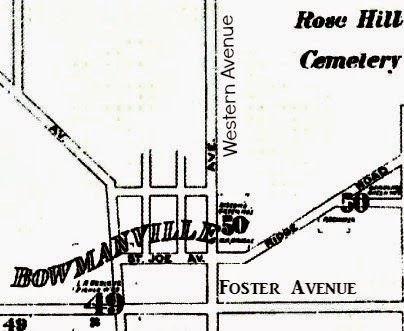 2013 Native American artifacts were discovered near the current neighborhood of Bowmanville on property the was once owned by Rosehill Cemetery.